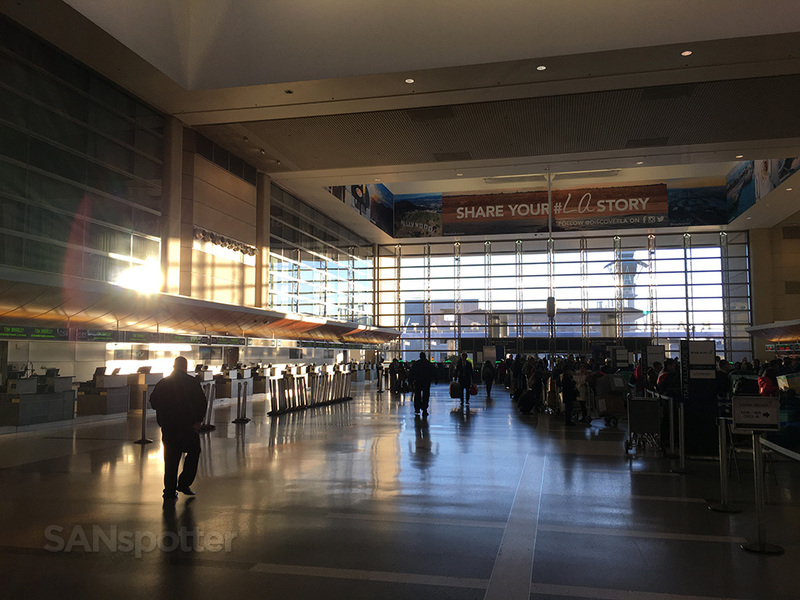 It was shaping up to be an absolutely beautiful morning in Los Angeles by the time I made the long walk over to the Tom Bradley International Terminal, though it was a bit chilly and I had to dip into the Delta and American Airlines terminals to warm up on my way around. Don’t let stupid TV shows like Baywatch and Beverly Hills 90210 fool you…it gets downright cold in Southern California during the winter months, and the idea that this place is a year-round tropical beach paradise is a load of crap. 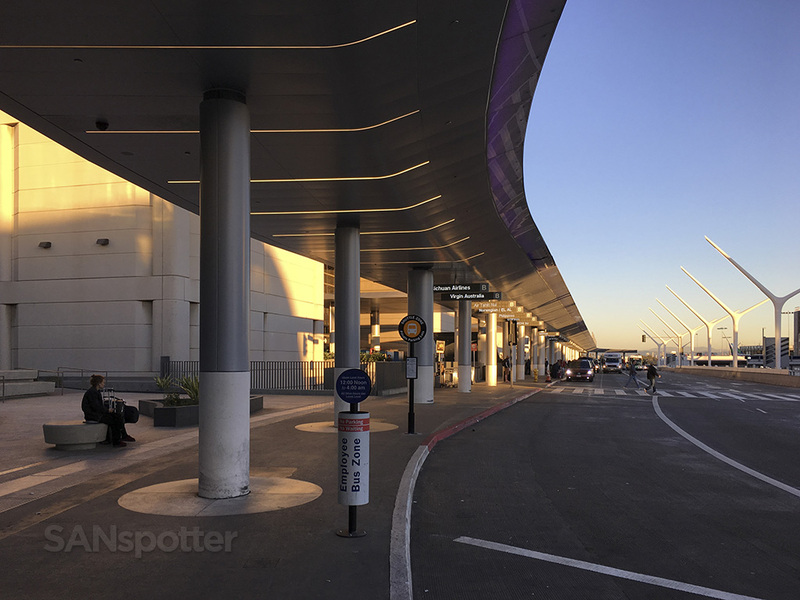 The LAX Theme Building. Going inside and having a look around has been on my list of things to do for far too long, but I can’t do it today unfortunately. Maybe next time. 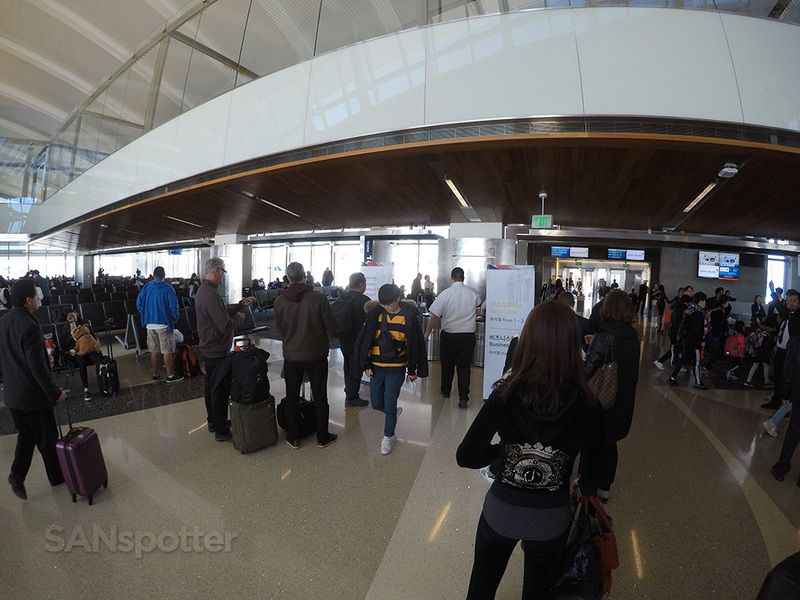 There it is: the Tom Bradley International Terminal. I’m so ready to start a new adventure! In my best Austin Powers voice: Yeah baby! 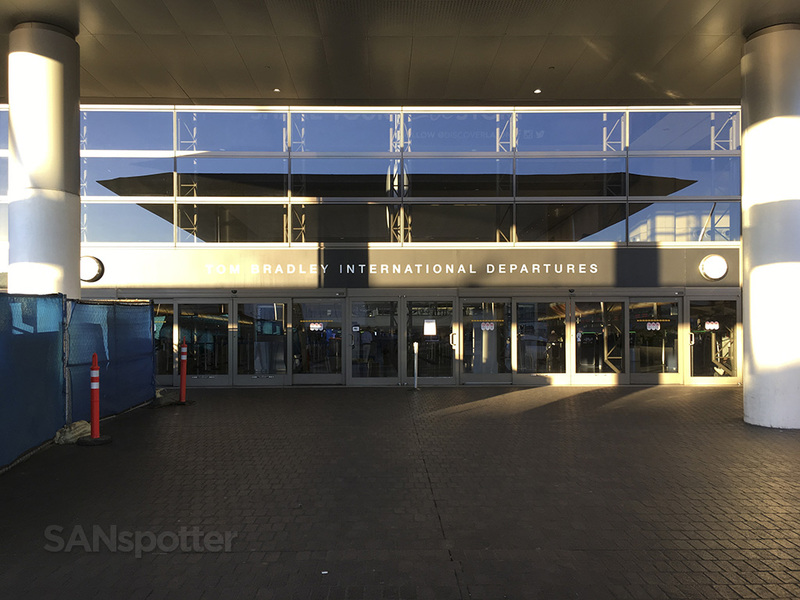 There’s nothing quite like the feeling of walking into the Tom Bradely International terminal (TBIT) to begin a long journey. Ahhh…this place feels like home to me. 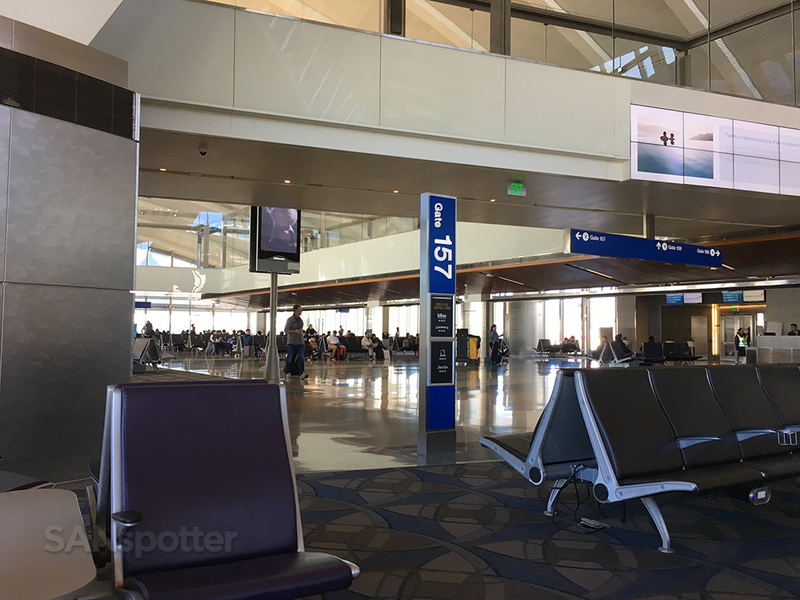 It’s not the most extravagant airport ticketing hall in the world, but it does hold a special place in my heart due to all the really great memories I have of this place. 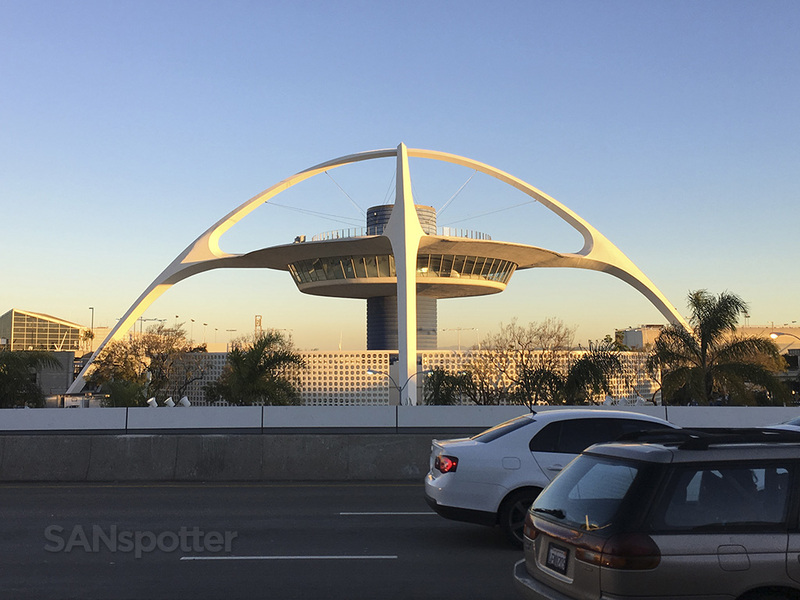 Those memories go all the way back to my early 20’s when I got bit by the travel bug and started to see the world for the first time – the world was still a huge and mysterious place to me back then, and the Tom Bradley International Terminal at LAX was the gateway to it all. 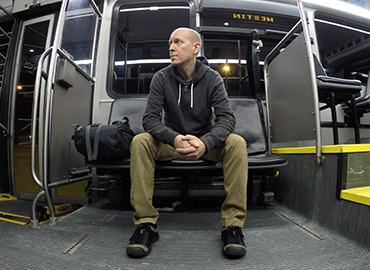 This is going to be a huge trip report, so if you’re short on time and you just want to get a brief overview of what this experience was like, you can do so by checking out this video I put together. All the gory pics and words will follow (as usual). 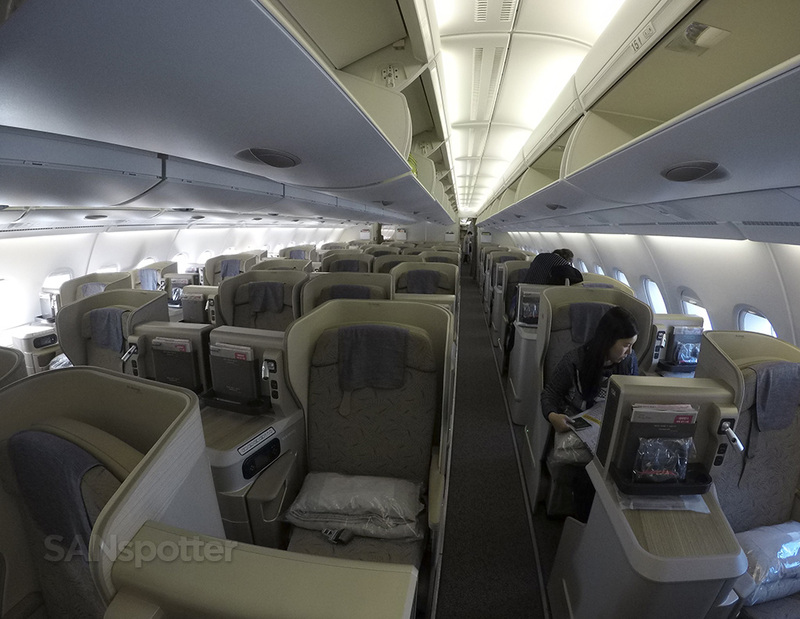 Seat map of the upper deck of this Asiana A380 (courtesy of seatguru.com) showing my seat for this flight. First order of business once inside was trying to get my seat changed from 12G (a bulkhead seat in the center section) to a window instead. 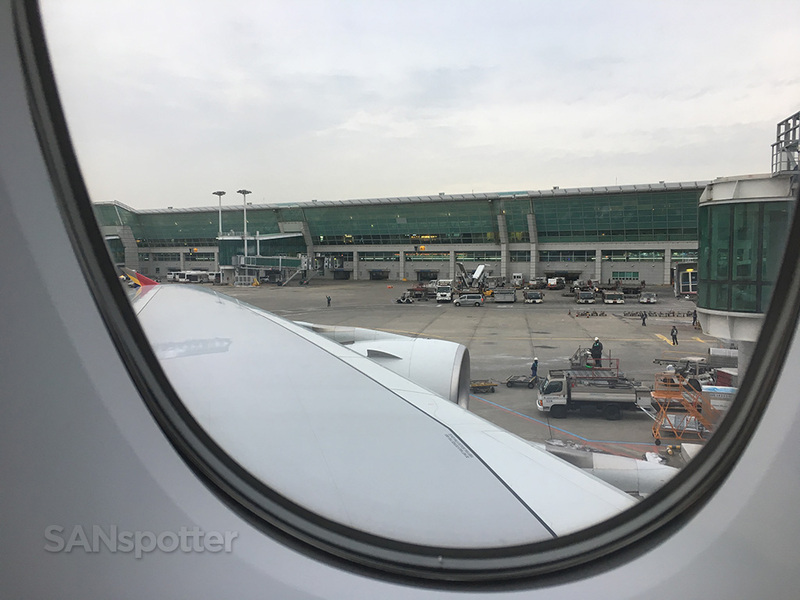 12G was what the reservation system gave me by default, but you know me…I’m a window seat guy through and through and I crossed my fingers with all my might as I approached the Asiana check in counter in the main ticketing hall hoping for the best. 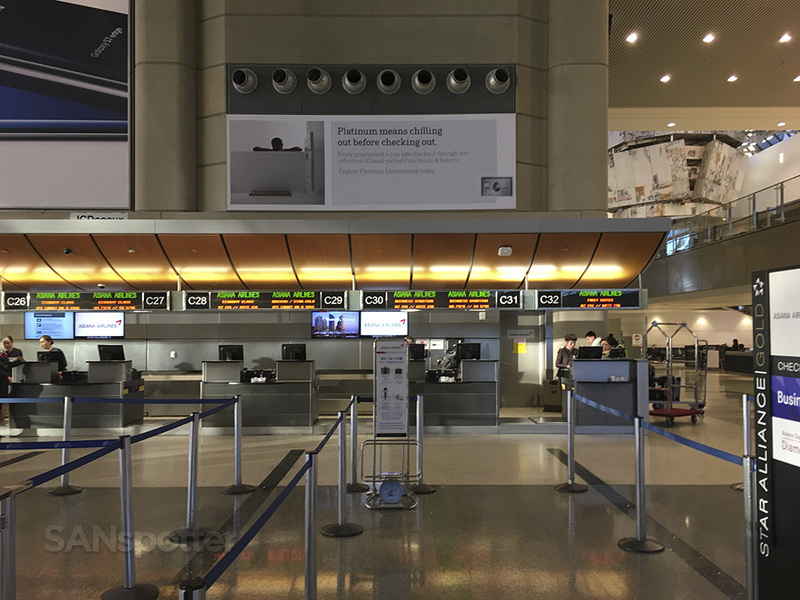 Asiana check in counter here at LAX. 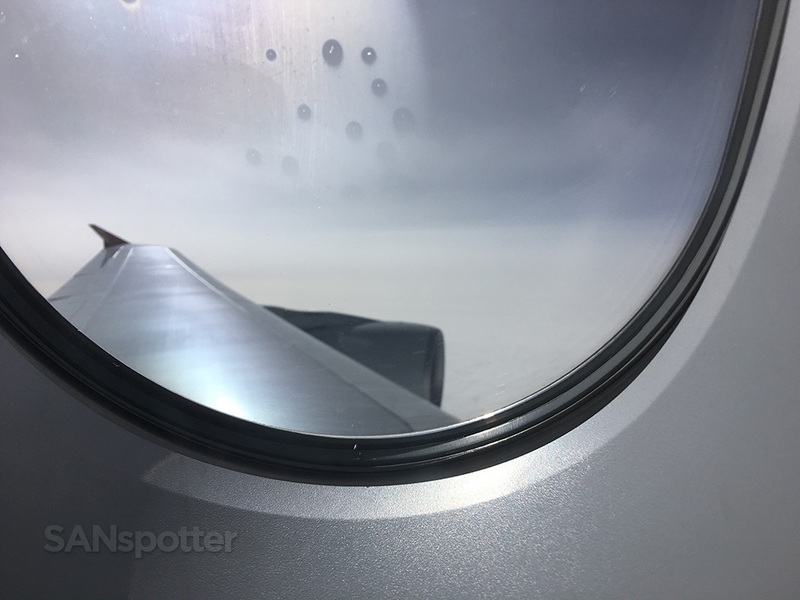 It turns out that luck was on my side this morning – not only was the friendly Asiana agent able to swap my seat assignment, she was also able to give me one of the more private window seats which are situated closer to the window. 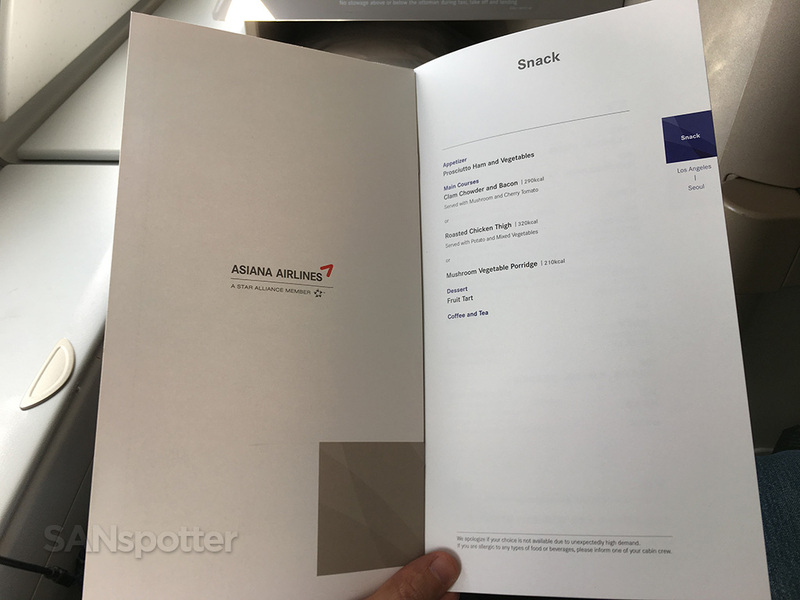 Business class on the Asiana A380 is a staggered layout, meaning that there are some window seats that aren’t really window seats. Sounds confusing, I know, but scroll below for the pics and you’ll see what I mean. 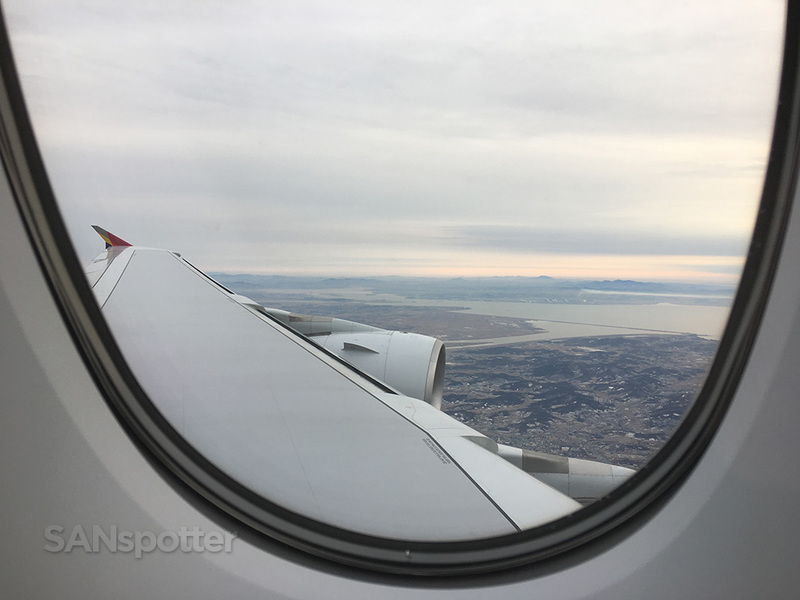 If you’re a solo traveler looking for the most private seat in Asiana A380 business class, ask for a window seat in an odd-number row. Have I mentioned how much I love this terminal? 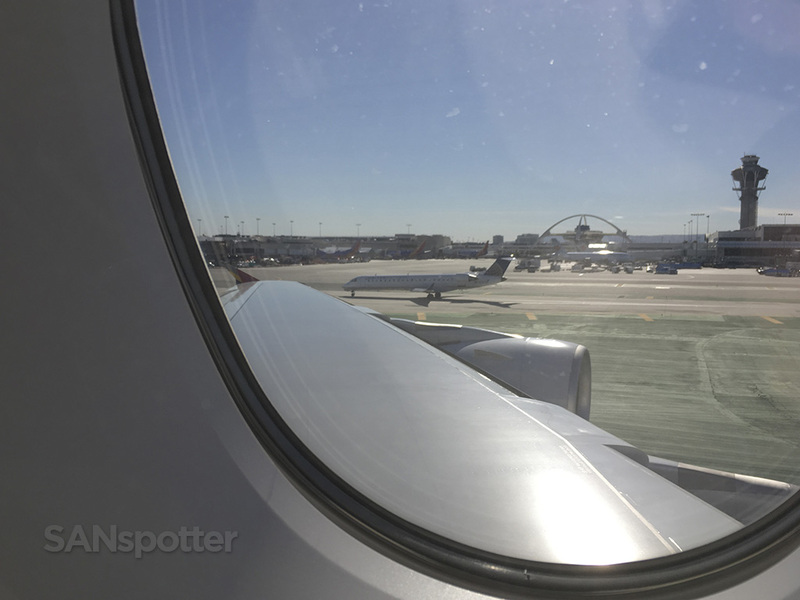 It’s good to be back at LAX. Unfortunately, my luck at the ticketing counter didn’t stay with me all the way through the security checkpoint. For some reason or another, the TSA was extremely interested in my backpack and they scrounged through that thing for a good 10 minutes trying to find whatever it was that looked odd in the x-ray. It takes me a long time to pack for these trips, so it was a bit irritating to have to re-pack my bag once they were through with it. Oh well. I was in a pretty good mood that morning anyhow, so even that unexpected bonding time with the TSA didn’t deter me from being a happy traveler. 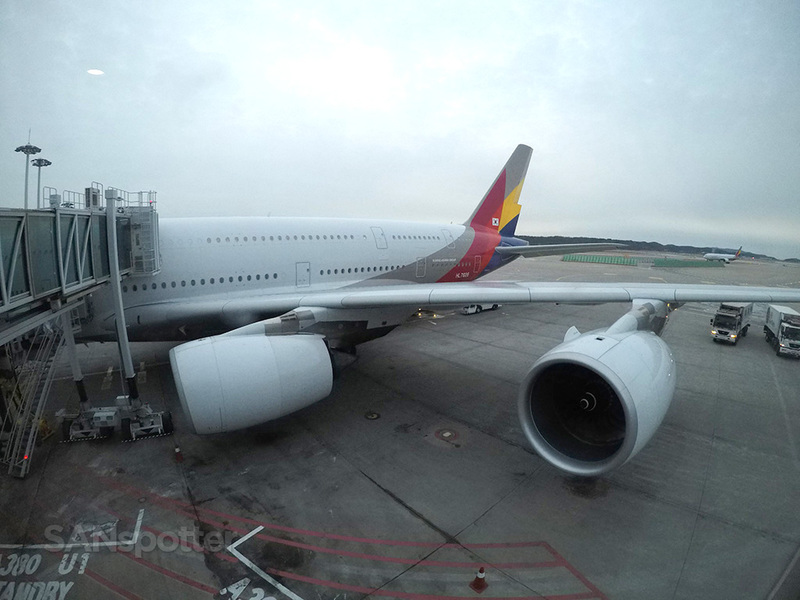 All I was thinking about was this Asiana A380 flight to ICN! 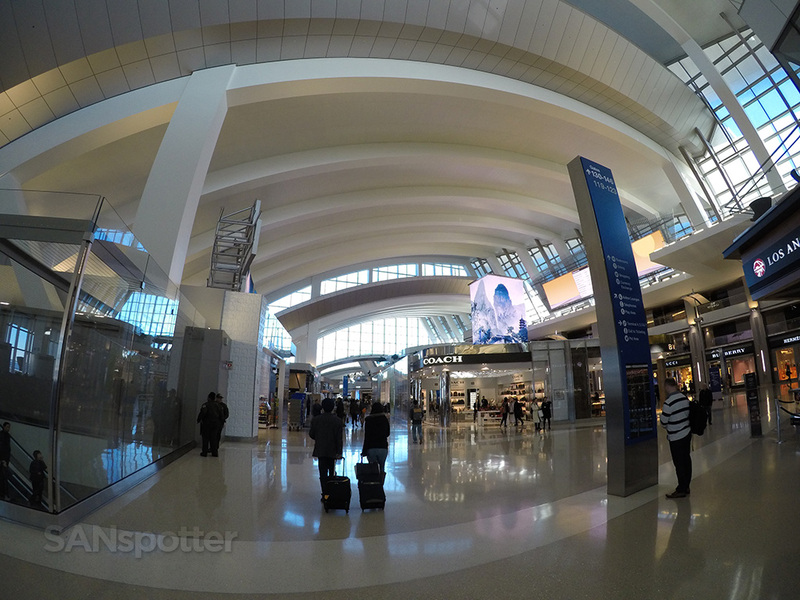 Inside the majestic new international terminal at LAX. This place used to be a total dump, but they really hit a home run with this redesign. One of the best airport terminals in the US no doubt. 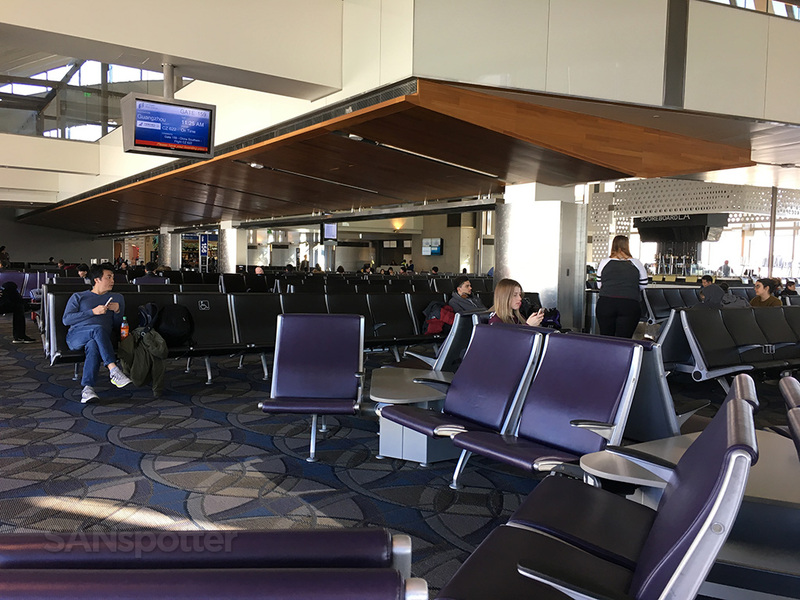 I arrived at gate 156 about 30 minutes before the scheduled boarding time, and right away I noticed how empty the gate area was. Where is everyone? 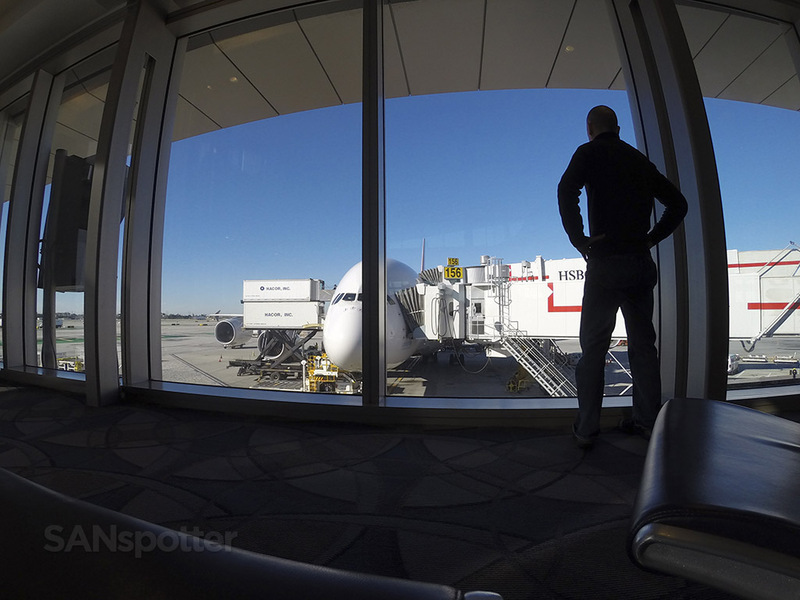 On all my previous A380 flights, it was nothing but chaos at the gate for at least an hour before boarding. But not today. It was quiet and calm, and finding a place to sit was not a problem. Odd. Where is everyone? Seems really odd that there’s nobody here at the gate so close to boarding time. 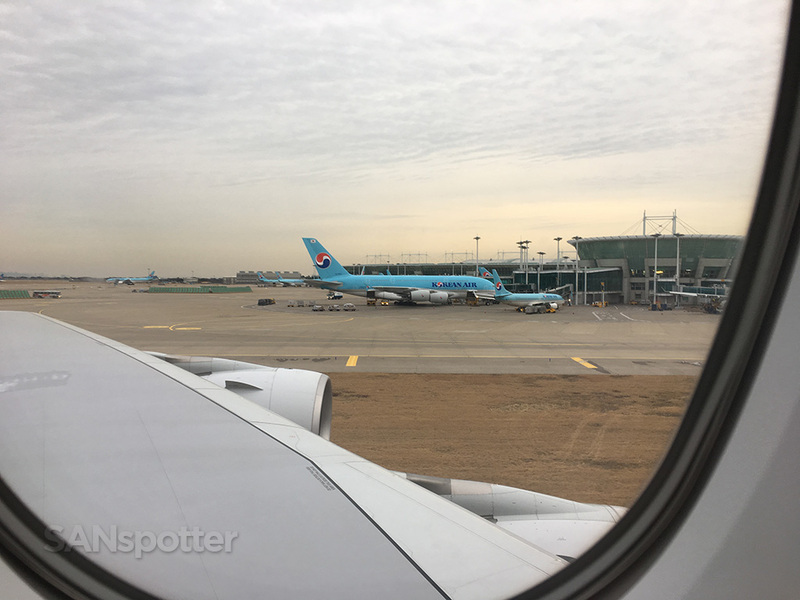 Unfortunately this was an end gate (the very last one on the south side of the terminal), so this was the best pic I could get of our ride to ICN today. 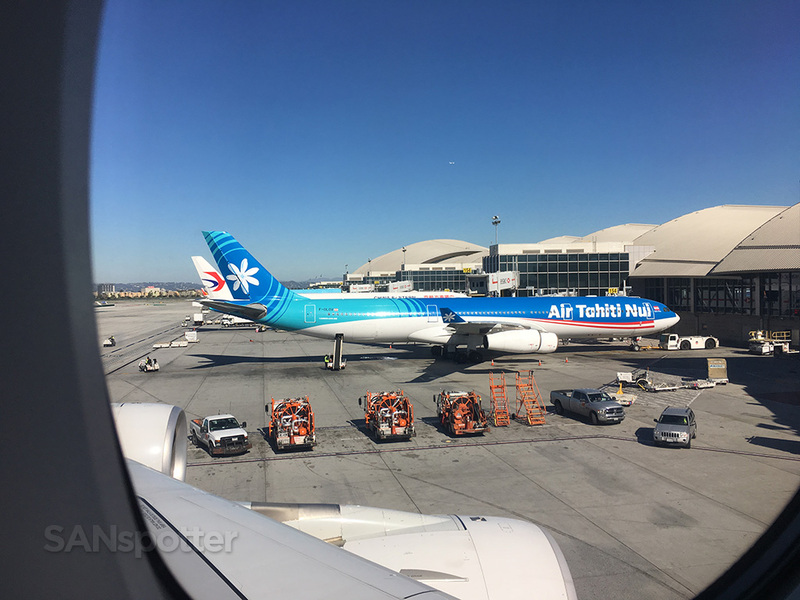 Interestingly enough, this aircraft (HL7626) was the same one that I flew on from LAX to ICN and then on to HKG in late 2015. That’s me, getting reacquainted with HL7626. Unfortunately the boarding time came and went without an announcement, and a quick check of the display behind the podium showed that they moved the boarding time back by 30 minutes. 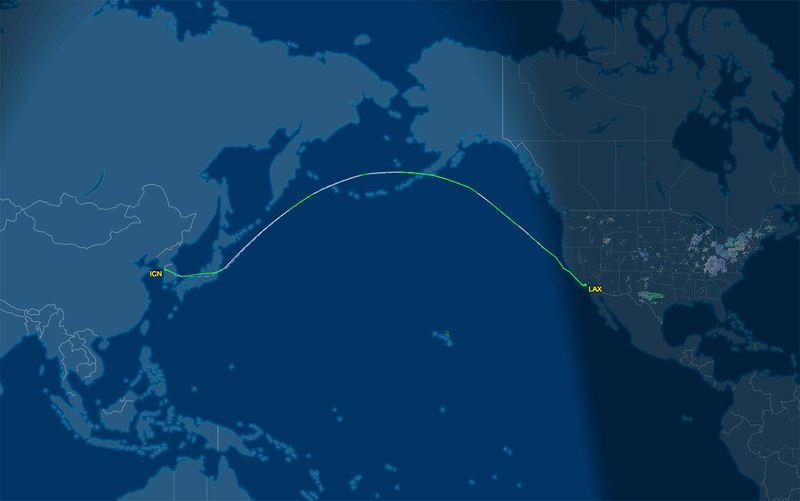 The most interesting part about that was that they were still posting an on-time departure. I didn’t think there would be any way that would be possible, but all in all it didn’t really matter to me. I didn’t have a connection to make in ICN so there were no worries on my end. Flight information display here at gate 156 showing an on time departure. I sat here for a while to wait. I appreciated how quiet it was, but…it seemed so odd that there was hardly anyone here. 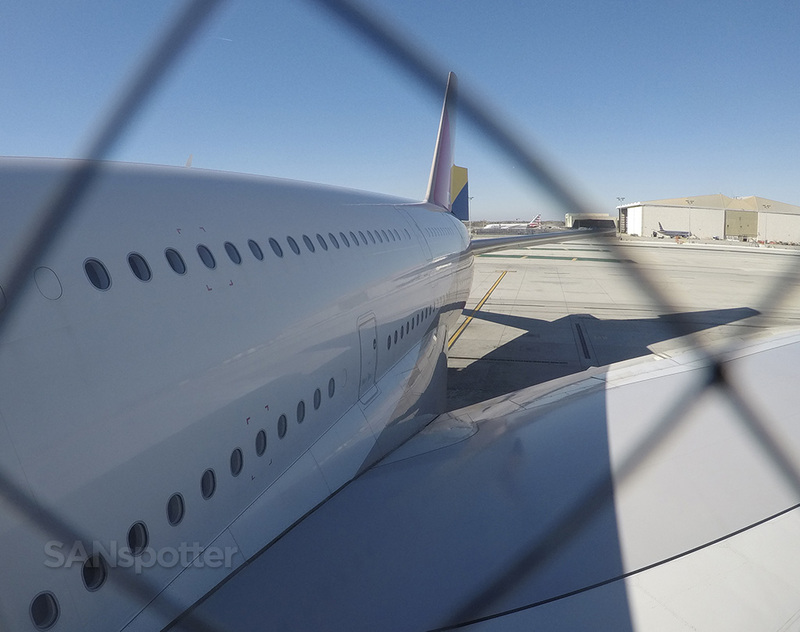 The Asiana ground staff held true to their word, and boarding commenced at exactly 30 minutes past the scheduled time. The gate area still seemed strangely empty to me though, and all I could think of was that there would be a wave of passgeners coming from the lounge at any minute. 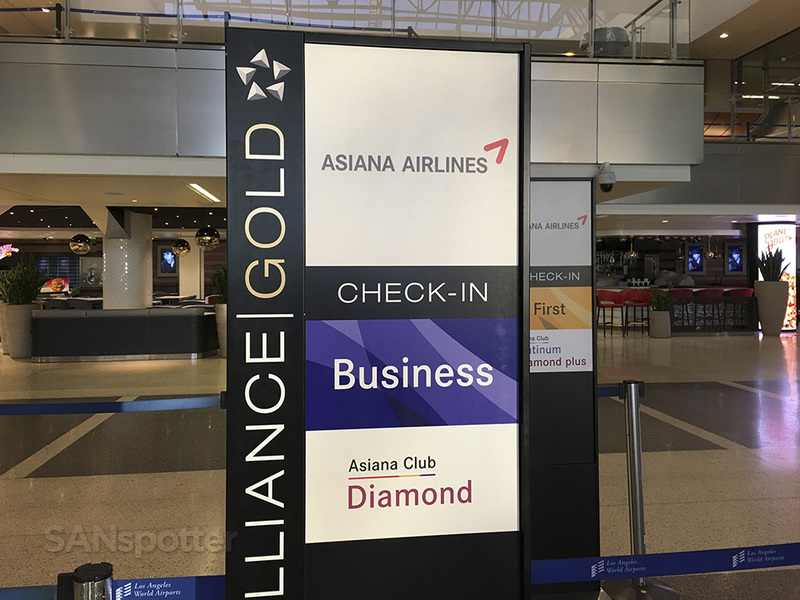 But I didn’t stick around long enough to see – I just wanted to get on that airplane as soon as possible to begin my Asiana business class adventure to Seoul! Individual queues are set up for first and business class passengers during the boarding process. Very streamlined and efficient IMHO. 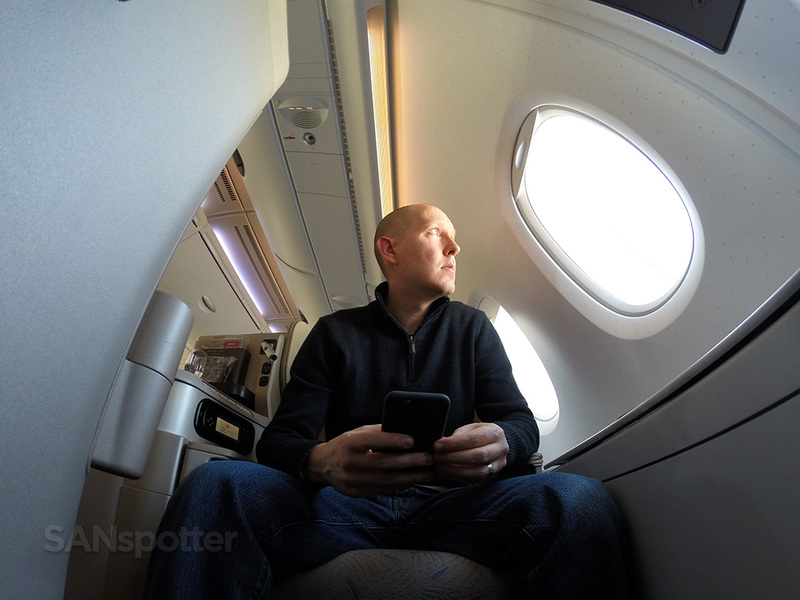 Business class is on the upper deck on the Asiana A380, so once past the podium there are some stairs to climb. 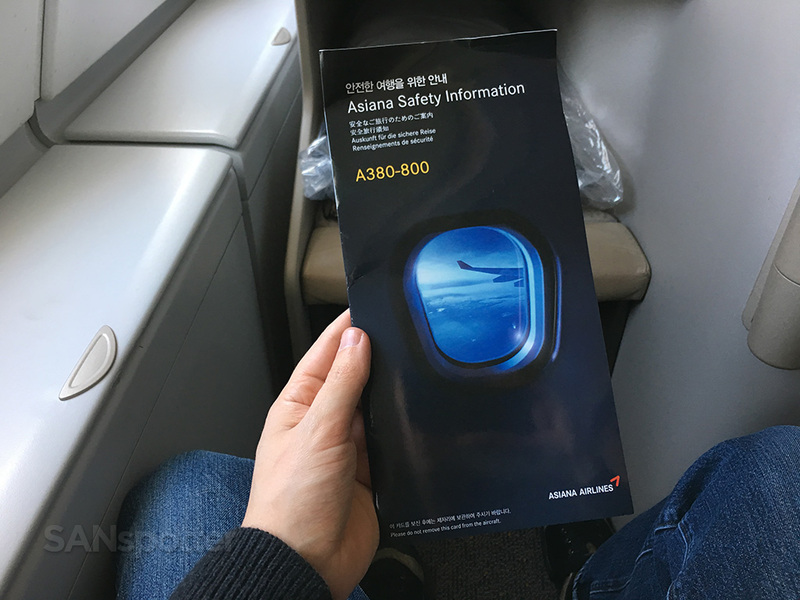 Asiana A380 upper deck, here I come. 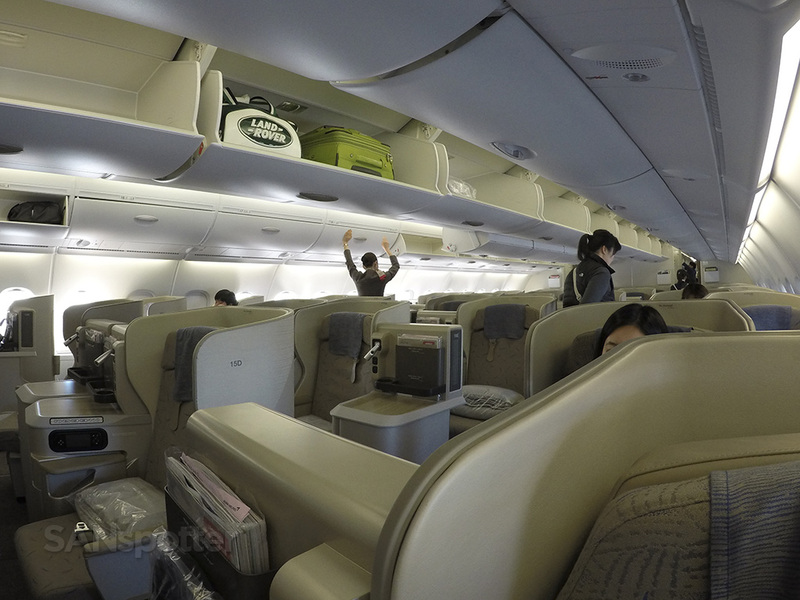 It should be noted that this was not the first time I’ve been on an Asiana A380. 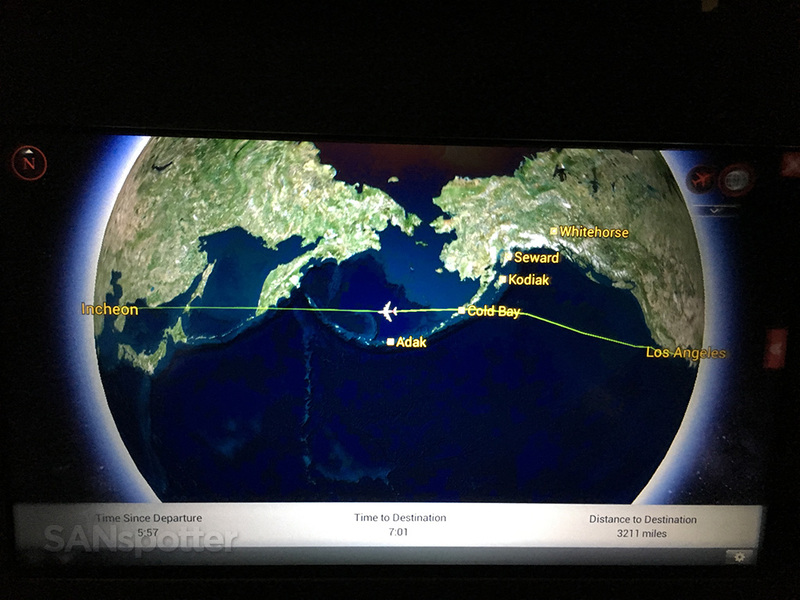 And it was not the first time that I’ve flown Asiana from LAX to ICN. The last time I took this exact flight was in October of 2015 (on this same aircraft as a matter of fact), and I was seated in first class for that one. 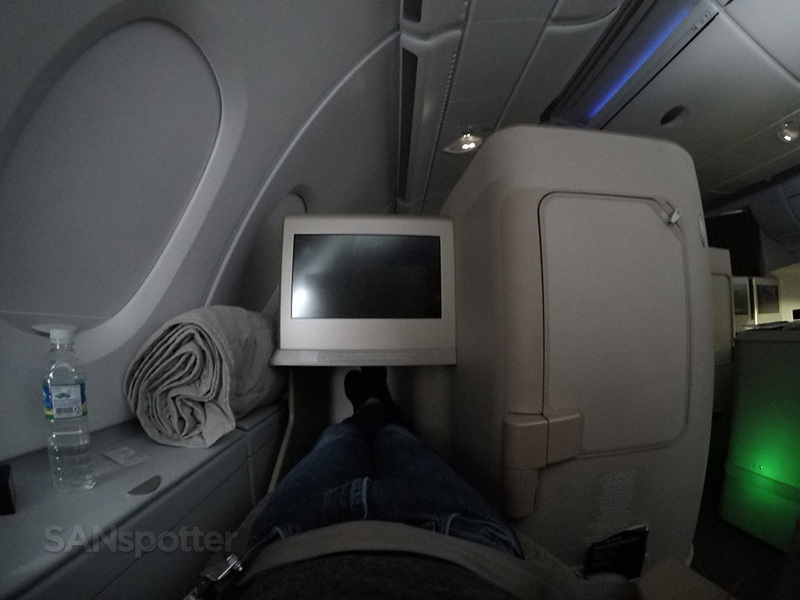 A magnificent in-flight experience that was – and I was really hoping that business class would be just as good. Of course I knew it would be, but I was trying to manage my expectations so not as to be disappointed. 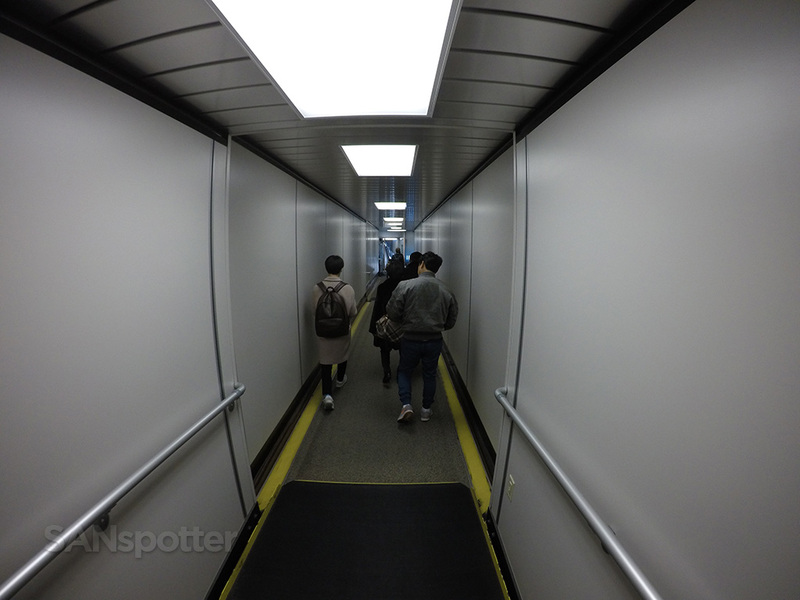 These A380 jet bridges are very long. 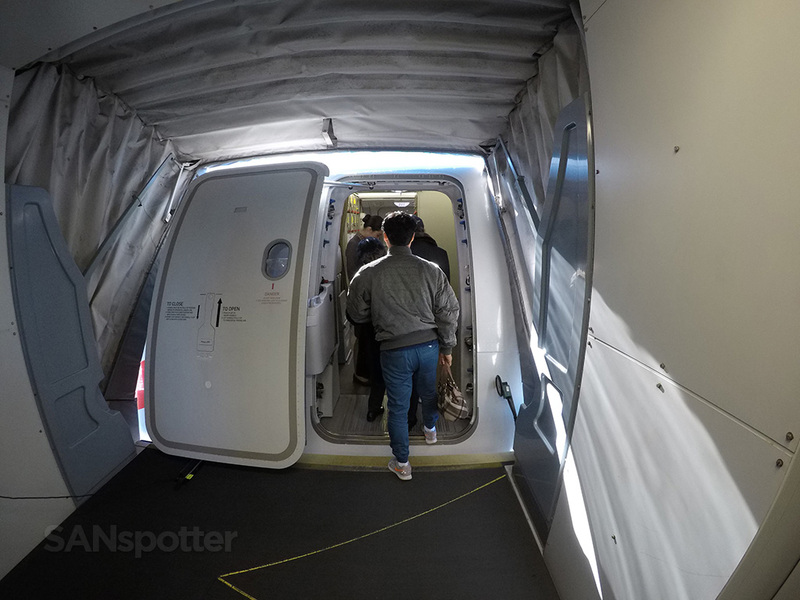 Asiana A380 upper deck boarding door. Almost there! 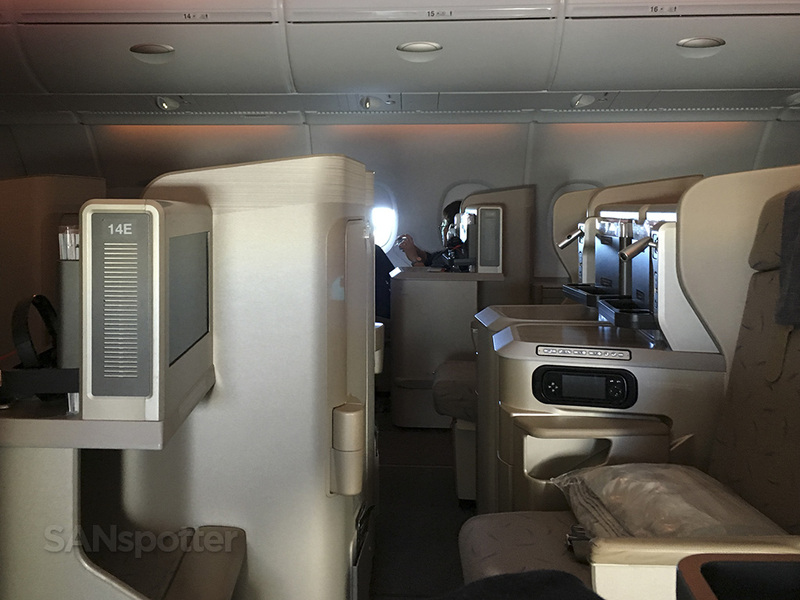 From this angle, it’s easy to see how the A380 is sometimes referred to as the “whale jet”. 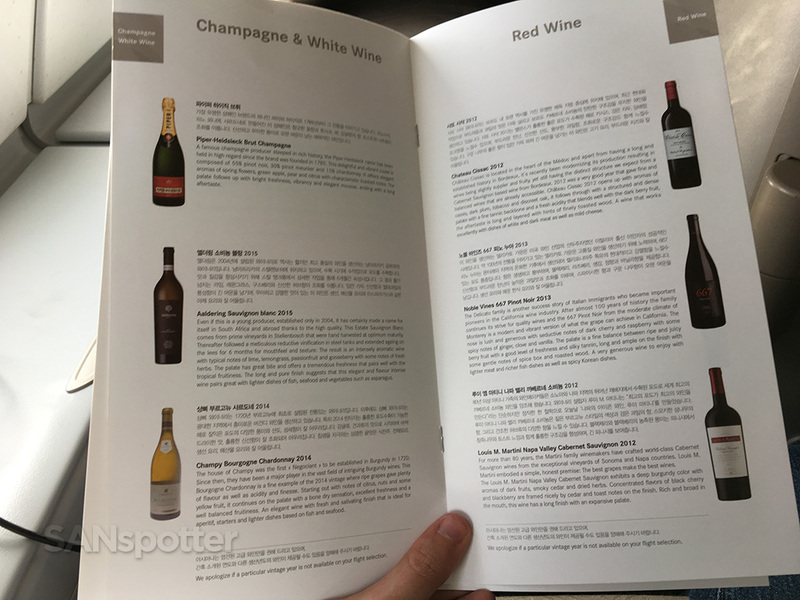 Business class is on the upper deck of the Asiana A380, and as soon as I stepped onboard I felt a rush of flashbacks to my LAX-ICN first class experience just over a year ago. 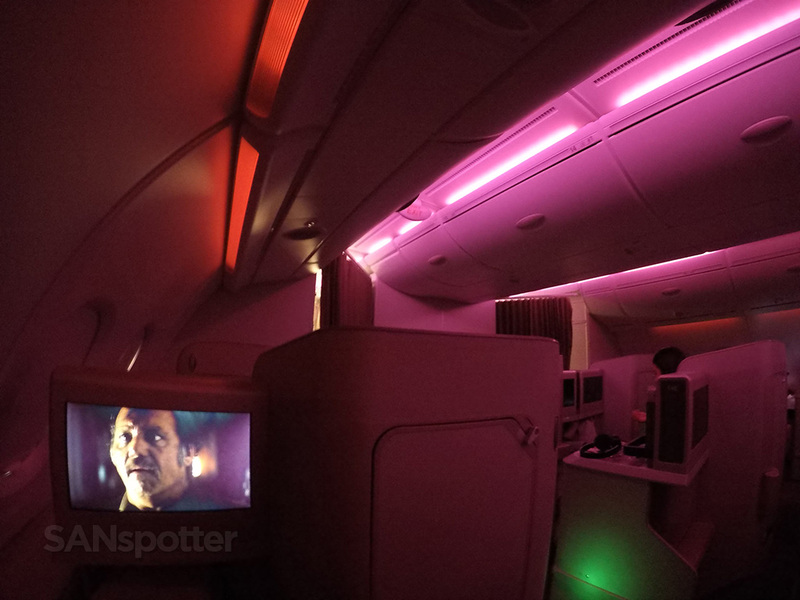 The colors and textures of the cabin were exactly the same, and even the seats looked the same, though smaller. I hadn’t even sat down yet and I was already very impressed. 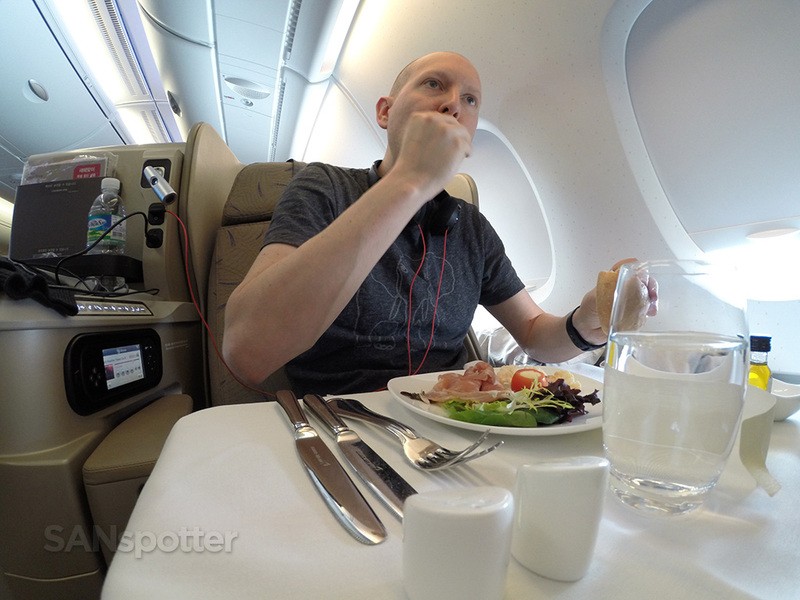 Who needs first class with business class seats as private as this? 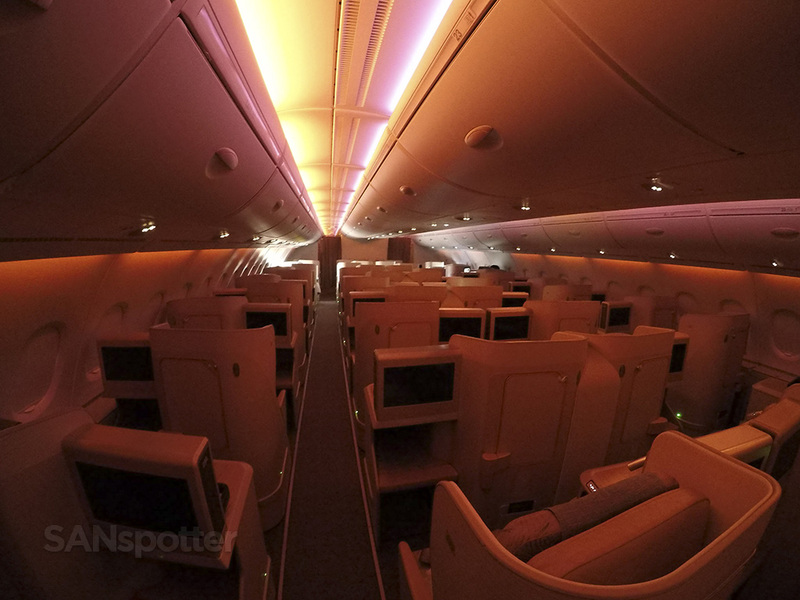 Asiana A380 business class cabin. 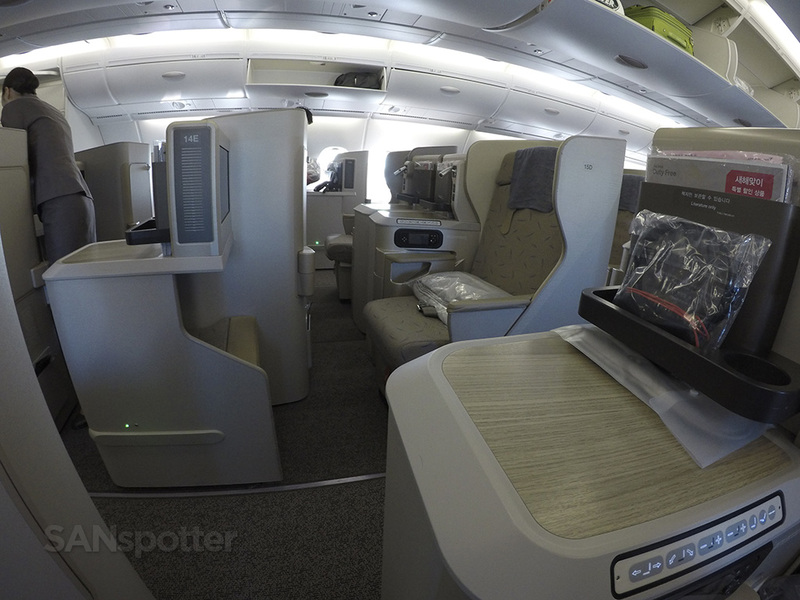 Asiana A380 business class seat 15A. 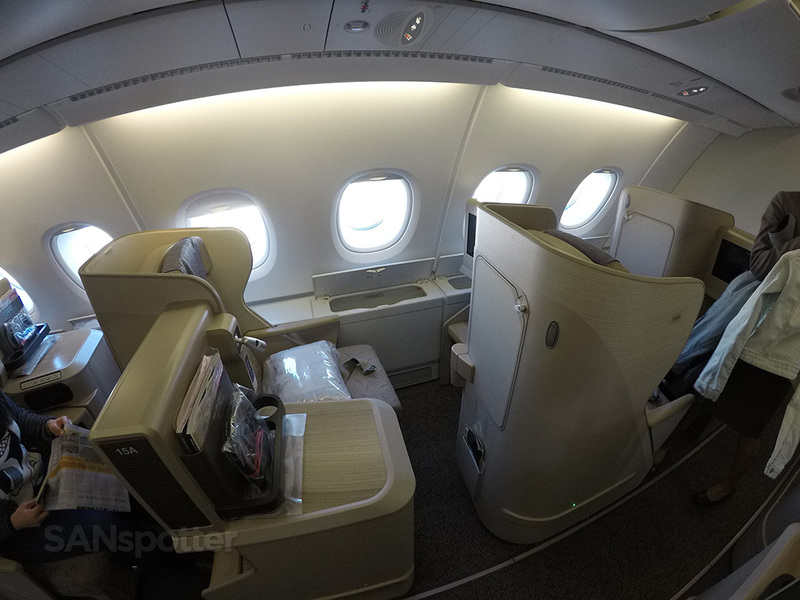 From certain angles, this business class cabin is eerily similar to first class here on the Asiana A380. Privacy is very good in these seats. 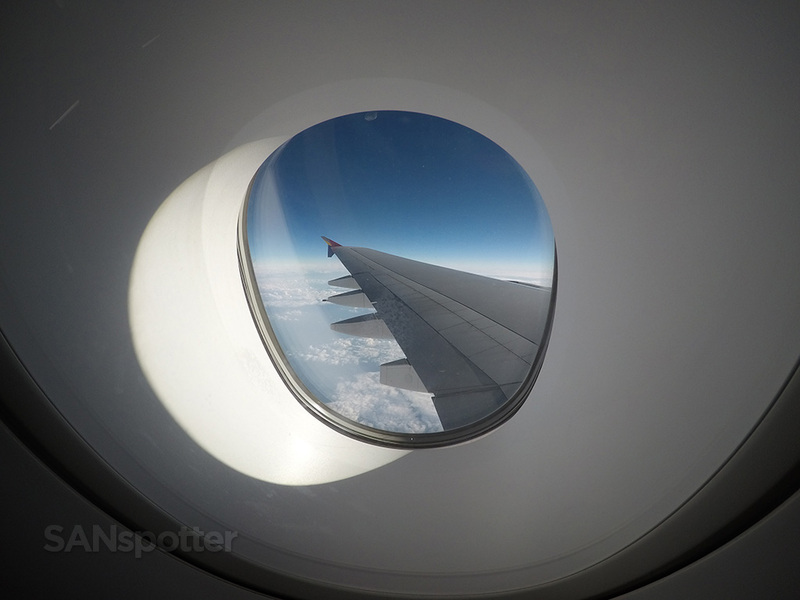 Especially if you’re seated in an “inner” window seat like this. 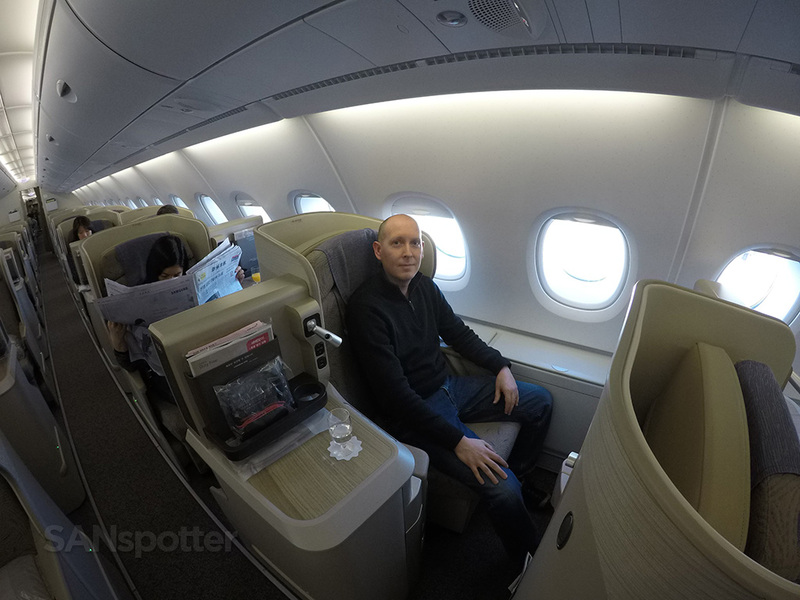 Nice and big video screen in Asiana A380 business class. 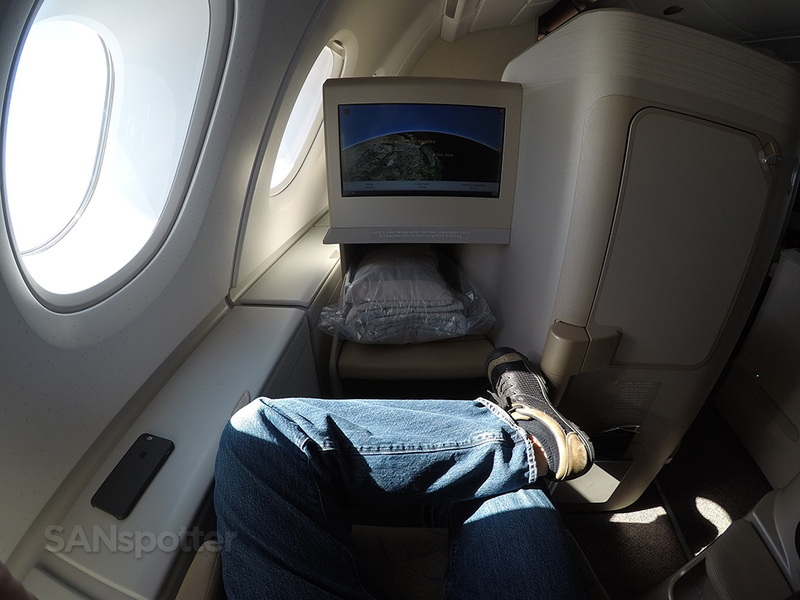 Legroom isn’t quite as good as it is up in first class, but it’s still quite spacious. 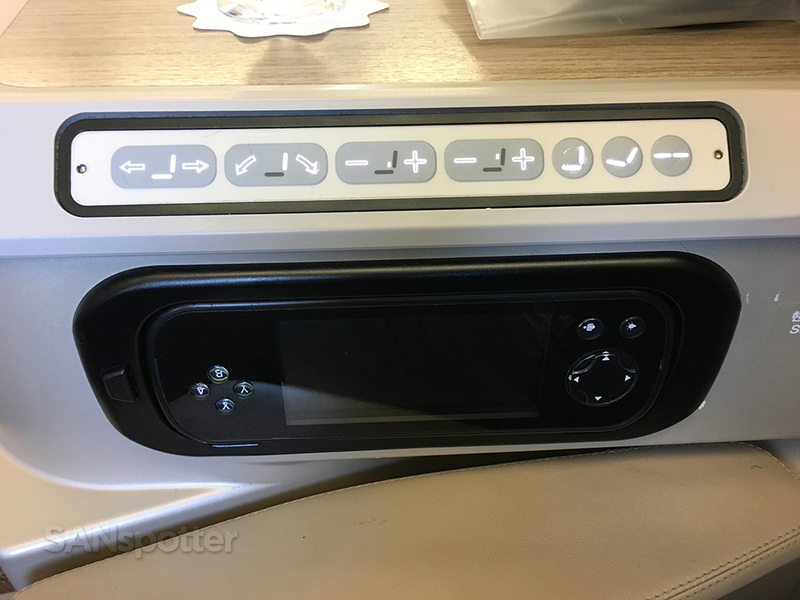 Power and audio ports, complimentary noise cancelling headphones, a reading light, and magazines are located in one convenient section of the seat. 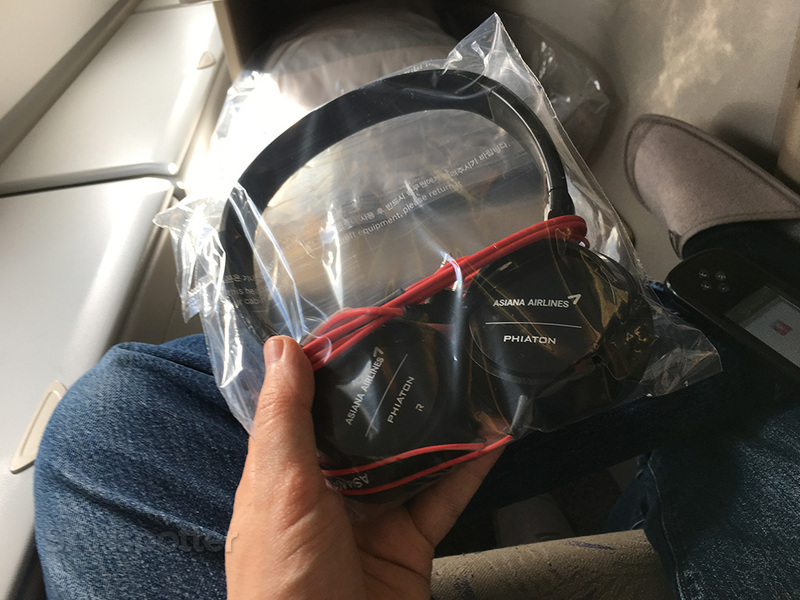 Asiana business class noise-cancelling headphones. 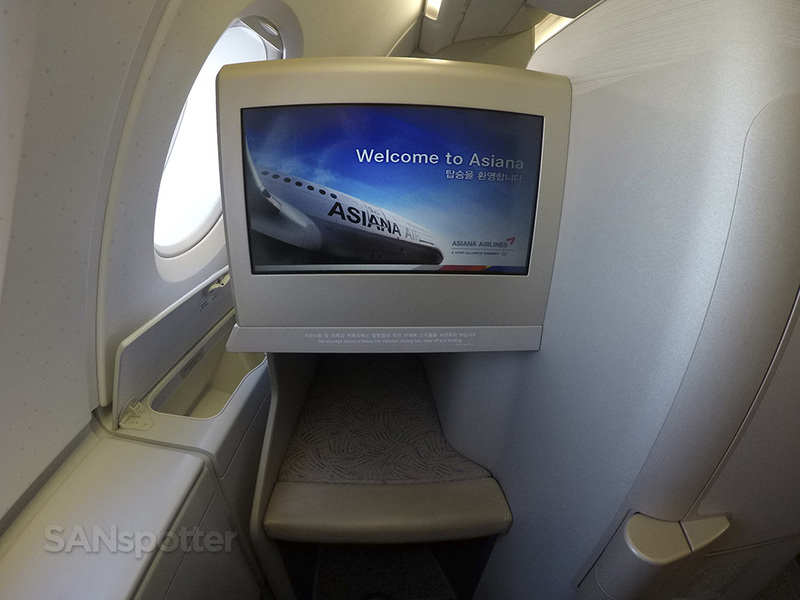 Asiana A380 business class seat controls and entertainment system touch-screen remote. These entertainment system remotes have come a long way over the years. They’ll be perfect as soon as they make them wireless! 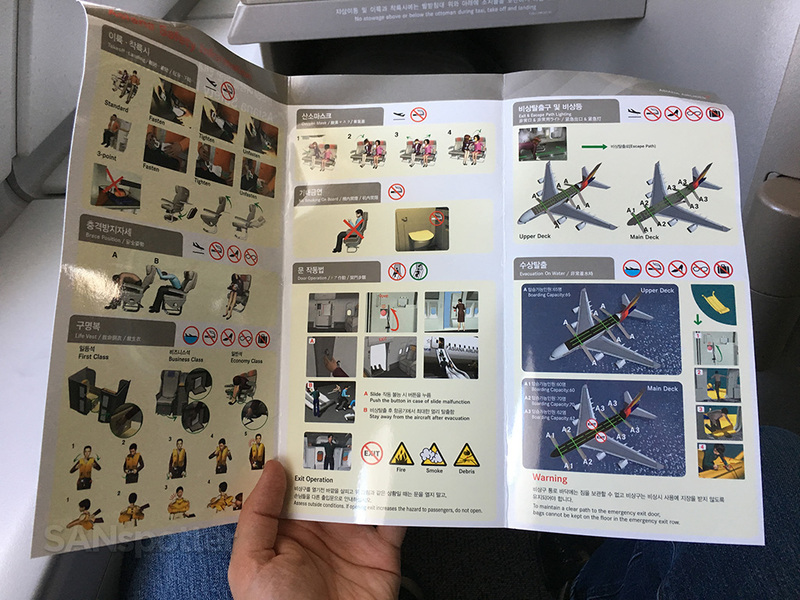 Asiana A380 safety card front cover. 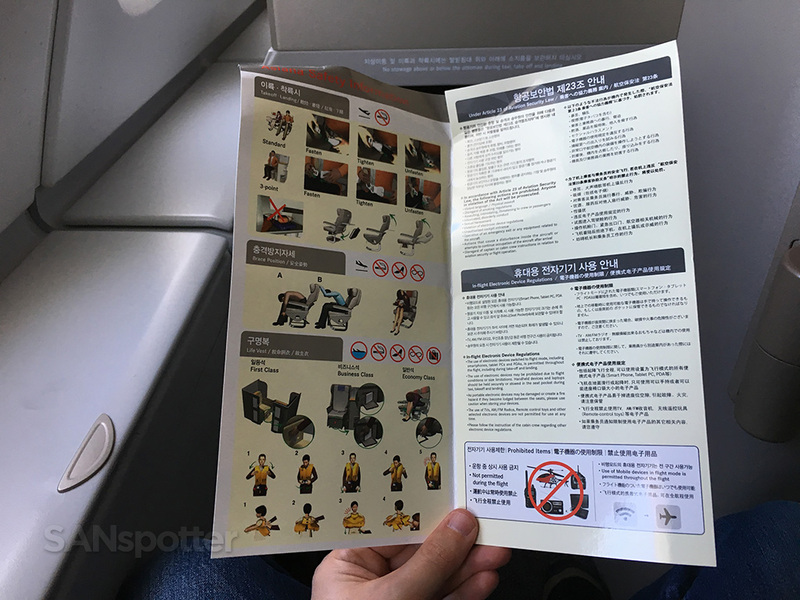 Asiana A380 safety card inner cover. 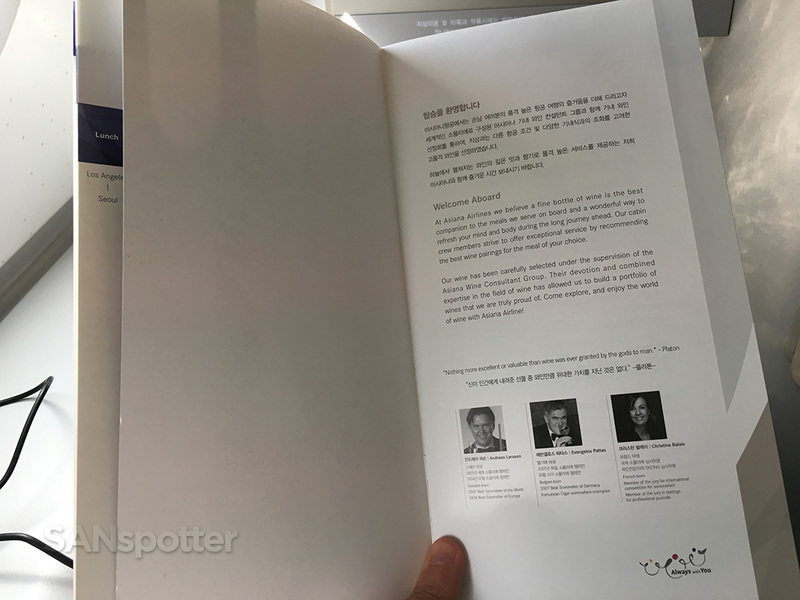 Asiana A380 safety card interior. 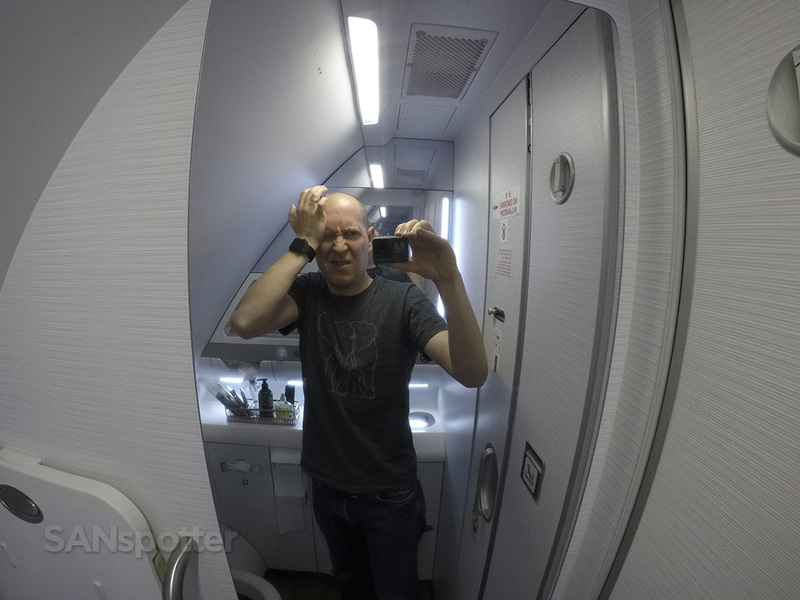 I was rushing around at first taking as much video and pics as I could before the cabin filled up with other passengers, so I wasn’t able to glide into the ambiance of international business class travel right away. But once I had what I needed for this trip report, I sat down and had a good look around. The cabin was still very empty! Lots of empty seats on this flight today. 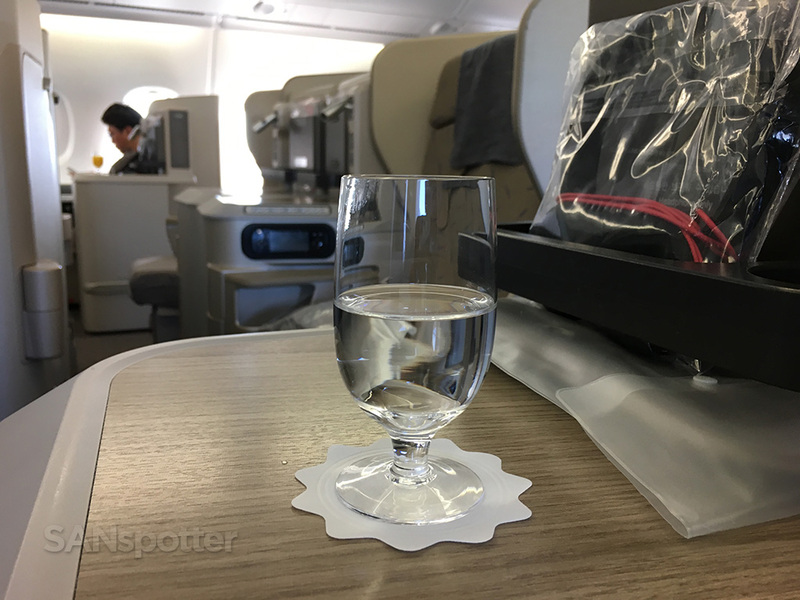 A flight attendant came by with a tray offering pre-filled glasses of orange juice or water. I chose water, and started to get myself situated for what was sure to be a really good flight. But those exceptions are a killer…I need to control those! Expecting the worst and hoping for the best has been my travel motto since the beginning, and it’s worked well for me over the years. No sense in breaking that tradition now. Complimentary beverages during the boarding process. Water for me right now – I’ll save the alcohol for lunch! 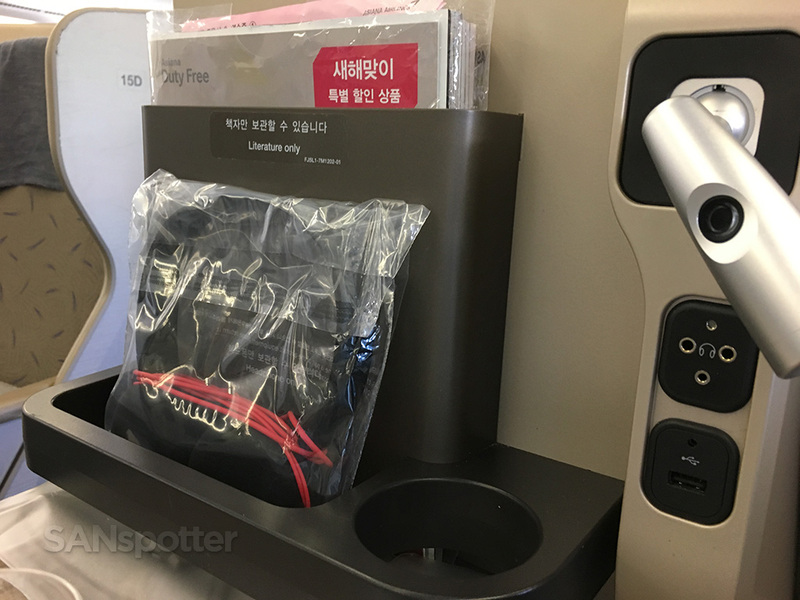 One interesting thing to note about this flight was that there were no amenity kits distributed. At first I simply thought they forgot to pass them out, but I later saw pre-packaged toothbrushes, toothpaste, combs, etc. in the lavatory. It was then that I realized that we wouldn’t be getting amenity kits, and I was bummed, but it made sense to me. It’s probably a lot more cost effective to do it this way. A lot less waste as well. Oh boy oh boy oh boy! Looking dead serious, but filled with excitement I promise you that. Yeah, I’m only drinking water, but…cheers! Typical of my experience from flights on other Asian airlines, the cabin temperature was a bit warm right from the beginning. 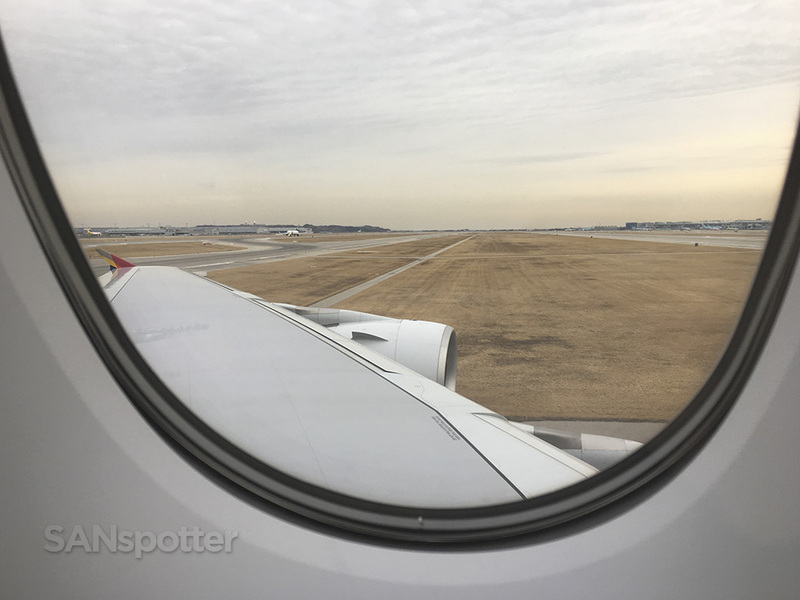 I was prepared for this however, and I started to shed layers as we were taxiing out to 24L. 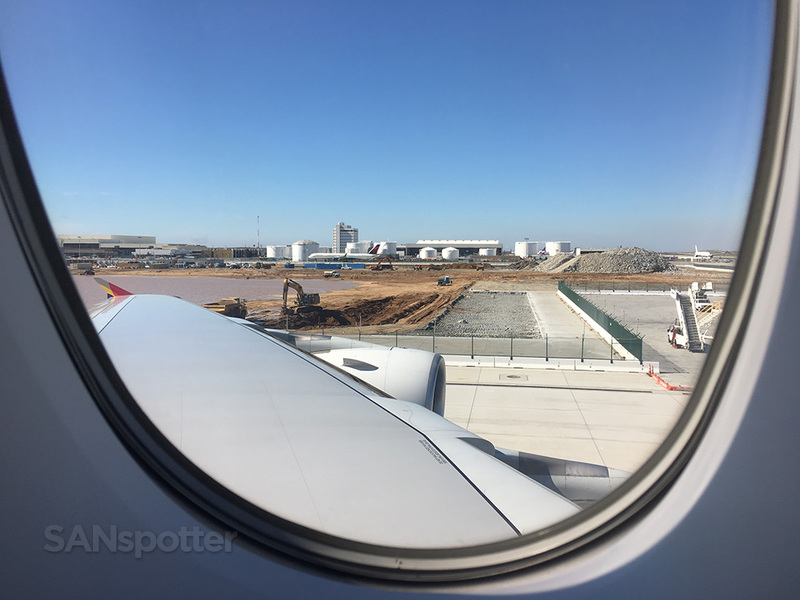 Lot’s of construction going on at the moment at LAX, and I’m really excited about it all. 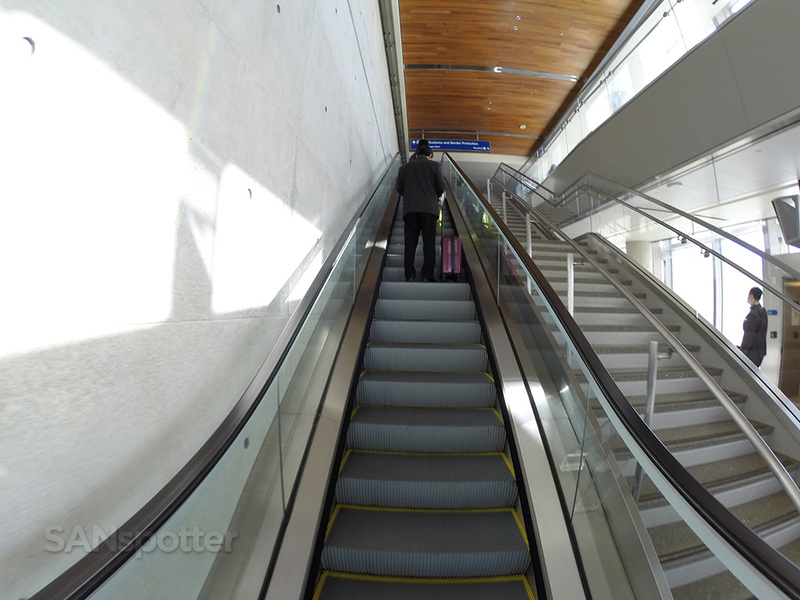 It’s going to be a world-class airport once all the improvements are complete. 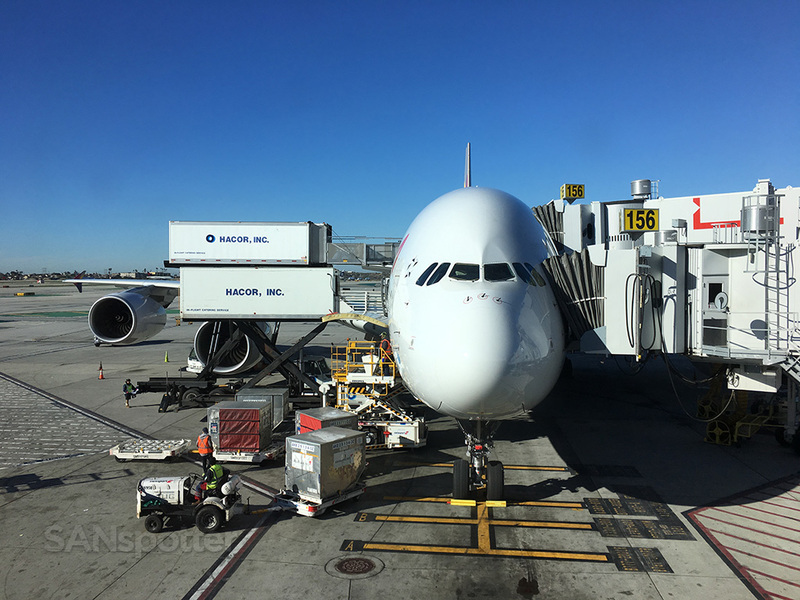 It can’t be easy to move a big A380 around a congested airport. But here we are, just about to roll onto 24L for departure. 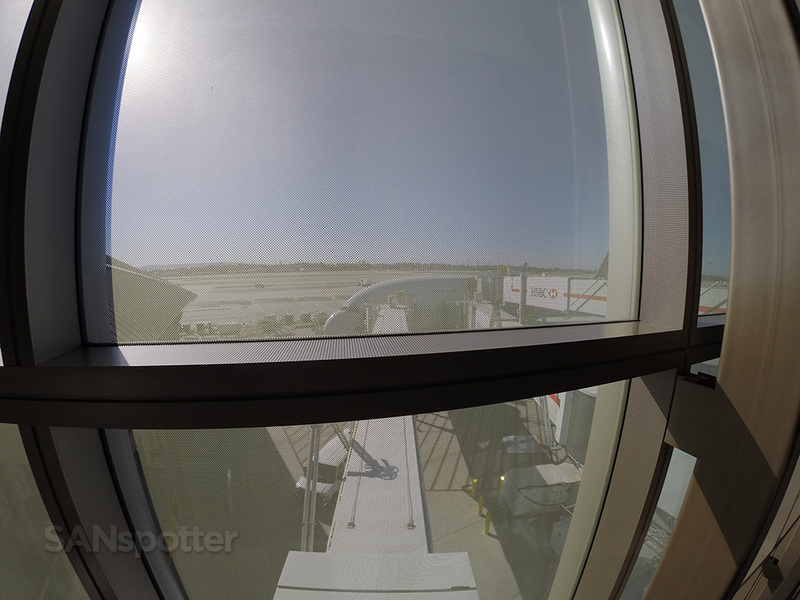 Unfortunately I was looking straight into the sun for the departure, so the pics aren’t that great. A380’s are SO quiet on takeoff. Not what one would expect from an aircraft of this size. 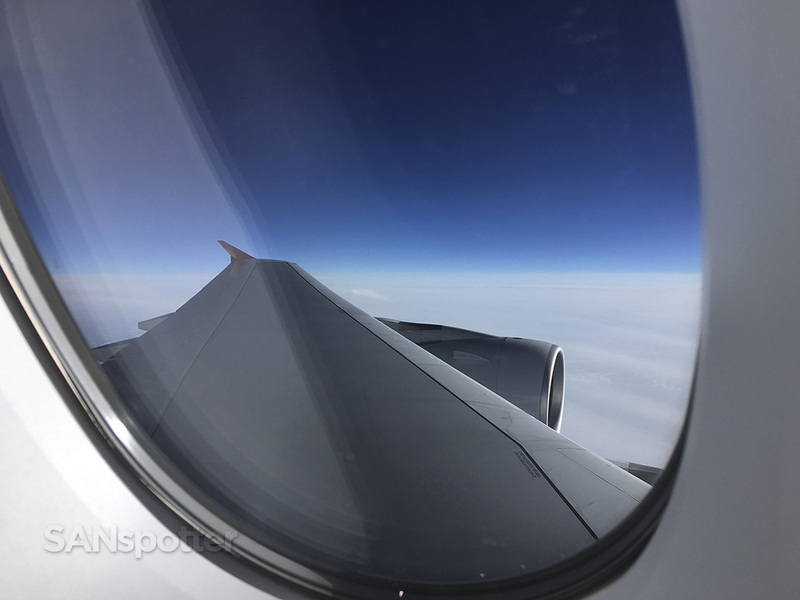 Out over the Pacific Ocean – we won’t see land again until Japan. 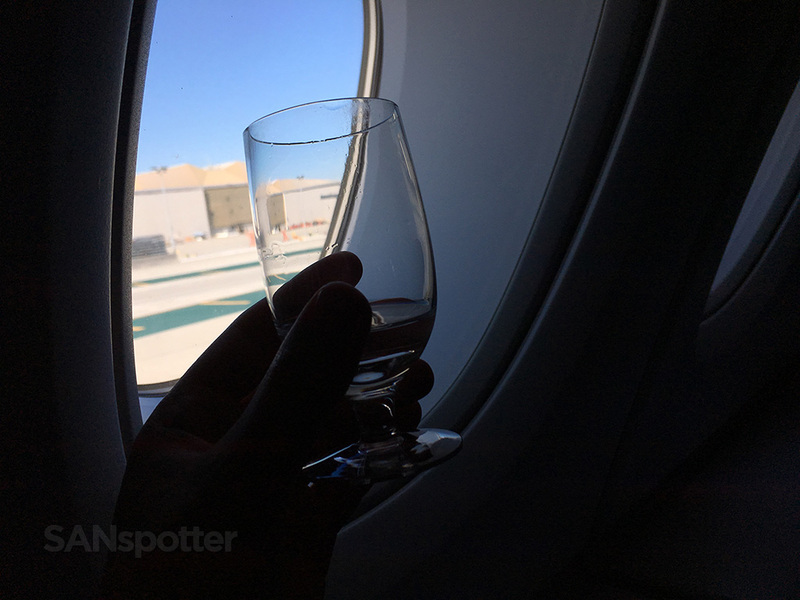 After what was one of the quietest takeoffs I’ve experienced in a good long while (these A380’s are darn near silent), it was time to hunker down and dig in to some of the best onboard service in the sky. First up was losing my shoes and donning the complimentary slippers. Then came the hot towel service, followed by the lunch menu. They wasted no time with the hot towels. Alright, here we go. Let’s have a look a the menu! It’s kind of odd that the welcome message was buried in the center of the menu, but oh well. 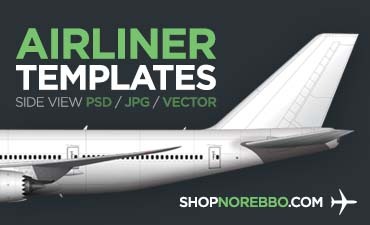 Let’s start with that before I show you the choices for todays flight. Here’s the snack menu (the second meal served just prior to landing). And finally, the wine list. 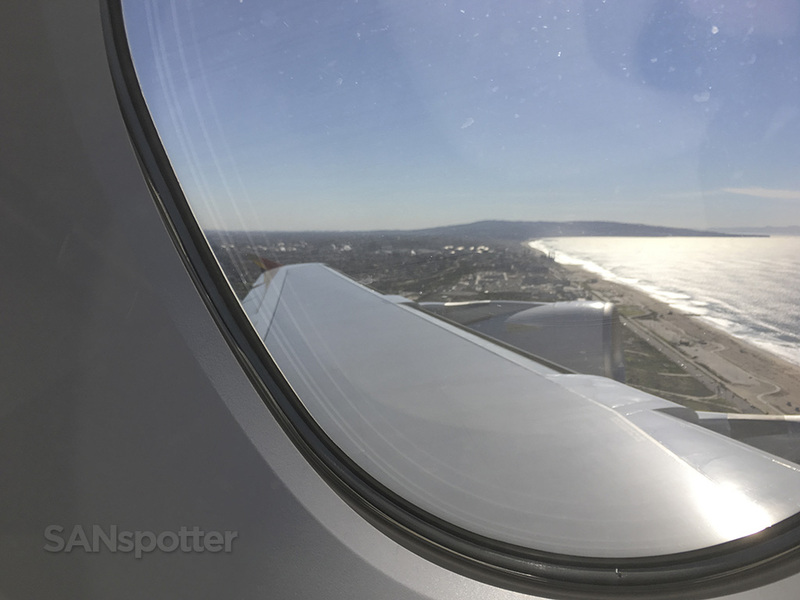 It was a bit of a bumpy departure out of LAX today, so the cabin service was delayed slightly as we climbed higher into smoother air. It didn’t take long though, and the flight attendants were making the rounds soon enough taking lunch and drink orders. 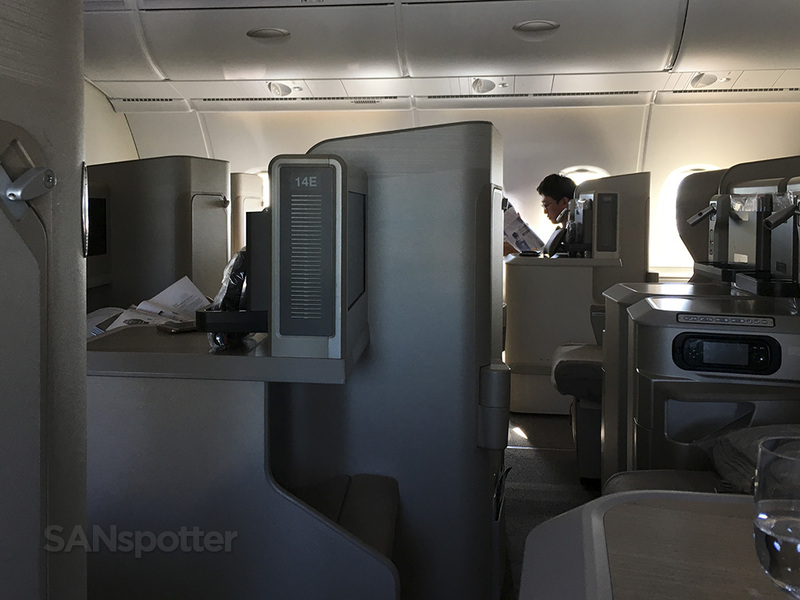 I will say that they had it really easy today though – the business class cabin looked to be only 1/3 full (if that) so they were visibly calm and cool as they did their thing. 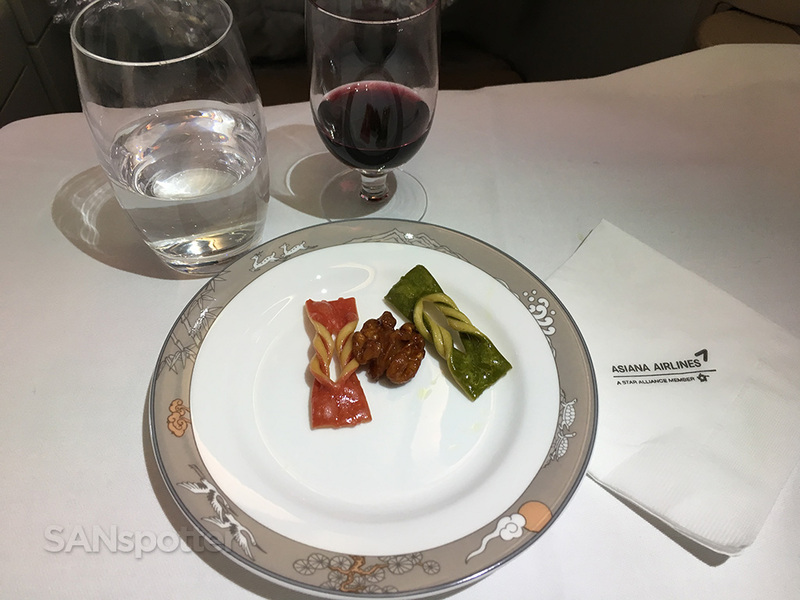 Asiana business class Korean style appetizer: Wrapped zucchini with salmon and brie. 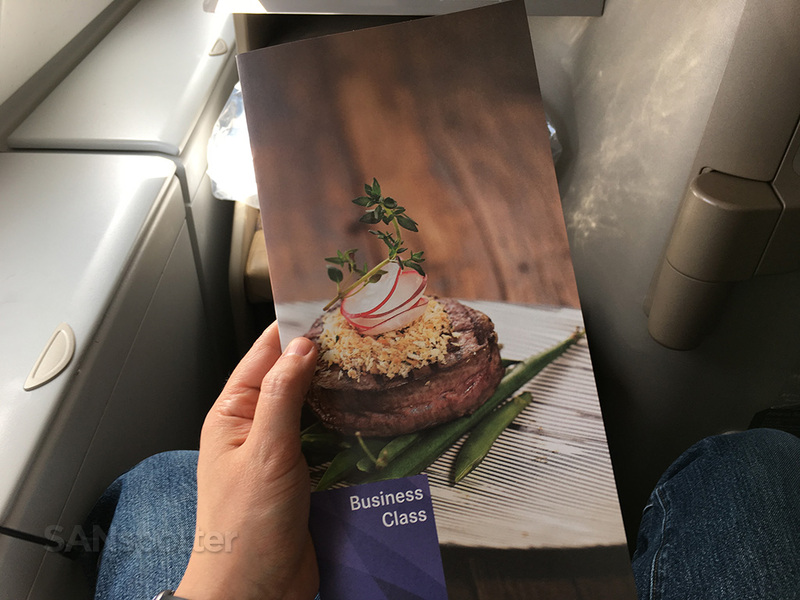 Asiana business class Korean style appetizer: beef vegetable roll. 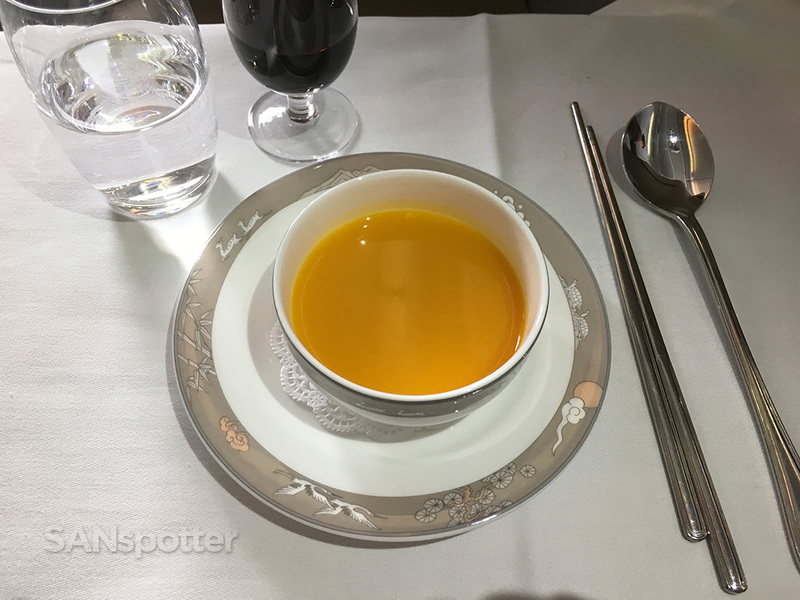 Asiana business class Korean style appetizer: pumpkin porridge (hobakjuk). 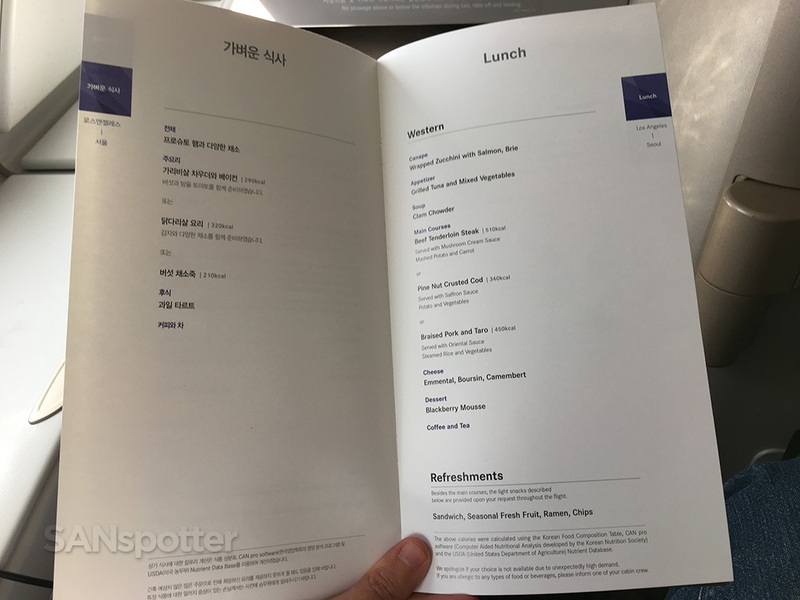 Asiana business class Korean style main course: ssambab. 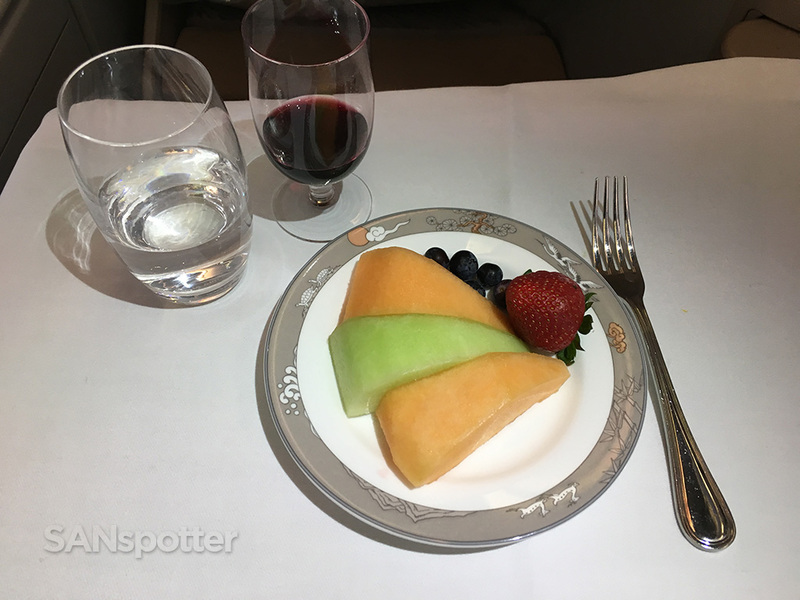 Asiana business class Korean style dessert: fresh fruit plate. Asiana business class Korean style dessert: Korean traditional cookies. A quick peek out the window after lunch. Not much to see, so might as well watch a movie! 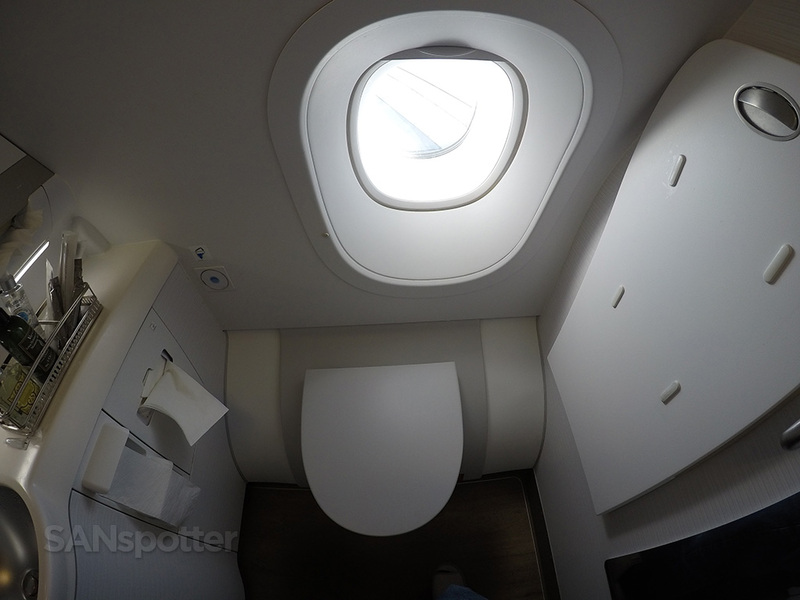 Lavatories with full size windows are my kind of lavatories. 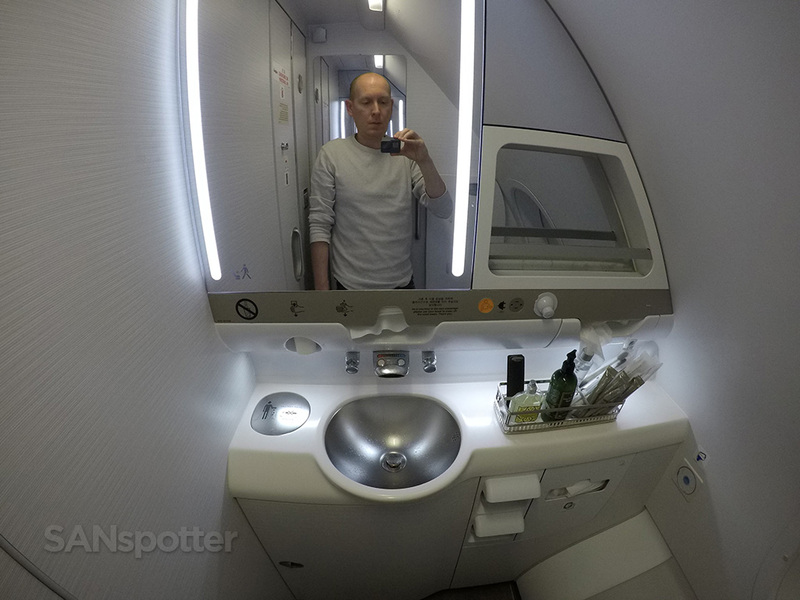 Getting nice lavatory pics is serious business. 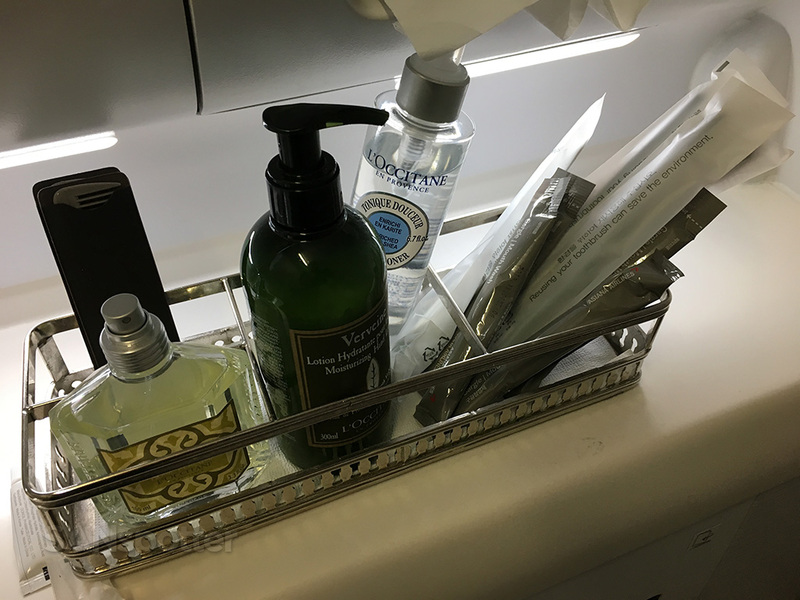 There were no amenity kits handed out on this flight, but toothbrushes, toothpaste, combs, etc were free for the taking in the lavatory. 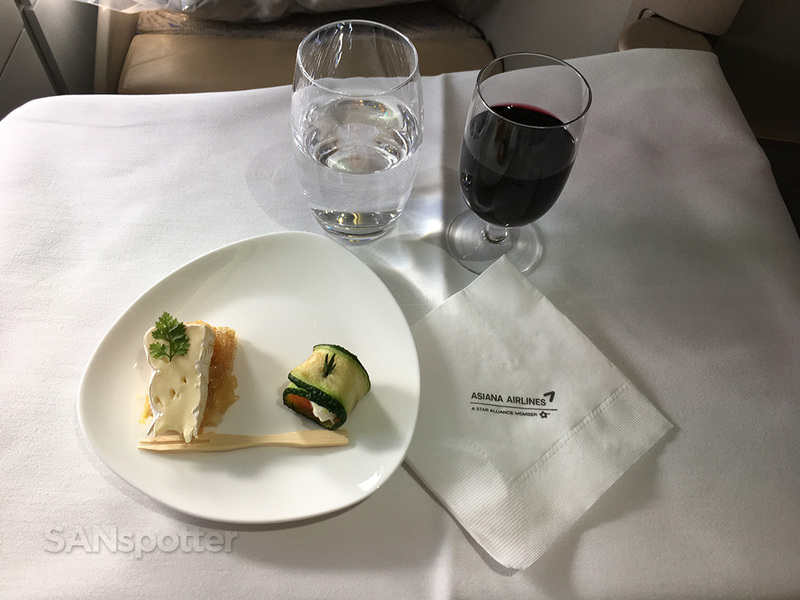 The lunch service is over, so now it’s time to sit back, relax, and get settled in for the long flight across the Pacific. I started watching The Magnificent Seven during the meal service, and it was interesting enough that I continued watching after my tray table was cleared. More hot towels and bottled water were disturbed after lunch, cabin lights were dimmed, and I was trying to make myself sleepy enough to grab some shut-eye. At least for a few hours. 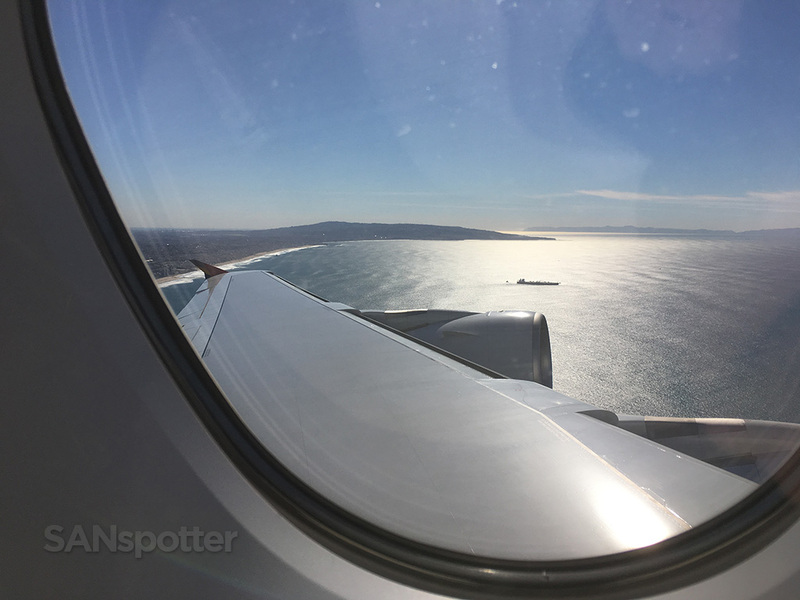 Unfortunately, This flight departed LAX at 11am, meaning that I was nowhere near being tired enough to sleep – so mostly I was just lightly dozing for the middle-portion of this flight. I can’t say the same for one of the other passengers seated just ahead of me and in the center section. That person (guy or gal I have no idea) snored like I have never heard snoring in my life. This person was just gasping for air on each breath, at an incredible volume, which made sleep impossible for anyone else who didn’t have ear plugs. This went on for about four hours, and it was extremely annoying. I actually saw a flight attendant smile and chuckle once as she walked by, obviously quite amused by the aggressive snorer. It was a brutal four hours though, and I was the happiest person in the world once that person finally woke up. Mental note: put ear plugs in my bag for the next trip! Trying to get some sleep, but it wasn’t easy with the snoring passenger to my right. The fact that the woman behind me didn’t shut her window shade wasn’t helping. 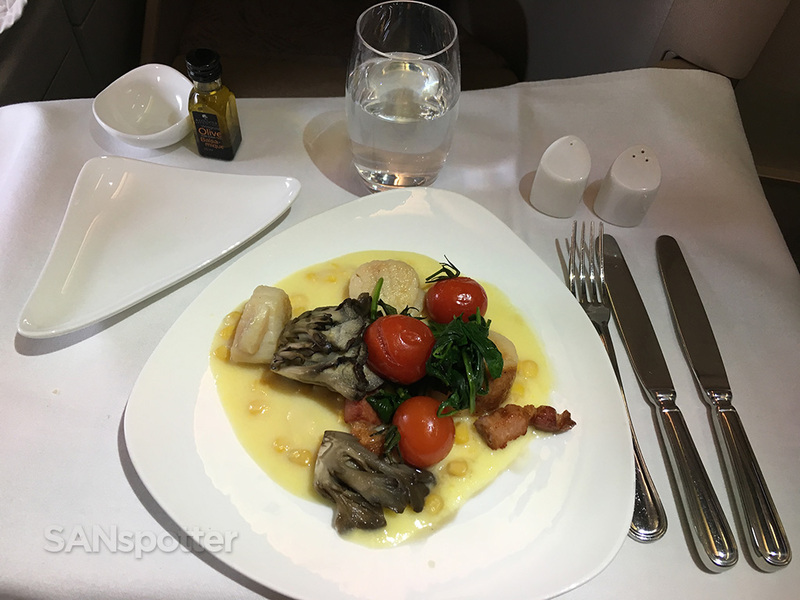 I decided to go for the mid-flight snack with about six hours of flying time to go, but for some reason or another the FA seemed to be ignoring me as she served other passengers. She did ask me something after lunch that I didn’t quite understand (she struggled a bit with English), and now I realized that she probably asked me if I was planning on having a mid-flight snack. I said “no” at the time, not really sure what I was declining.  Luckily, I was able to grab her attention as she was walking by. Choices were spicy ramen noodles or a sandwich, and since I didn’t feel like anything spicy, the sandwich it was. It was actually pretty good! 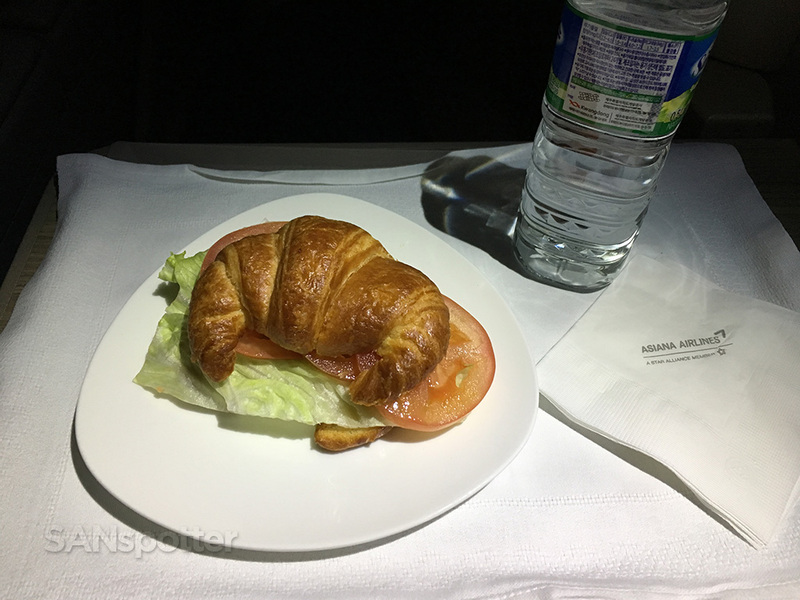 It was amusing to me how similar it was to the croissant sandwich I had on my AeroMexico 787 flight from TIJ to MEX last year, and I couldn’t help but wonder if they were made in the same factory by the exact same people. It was good though. No complaints. 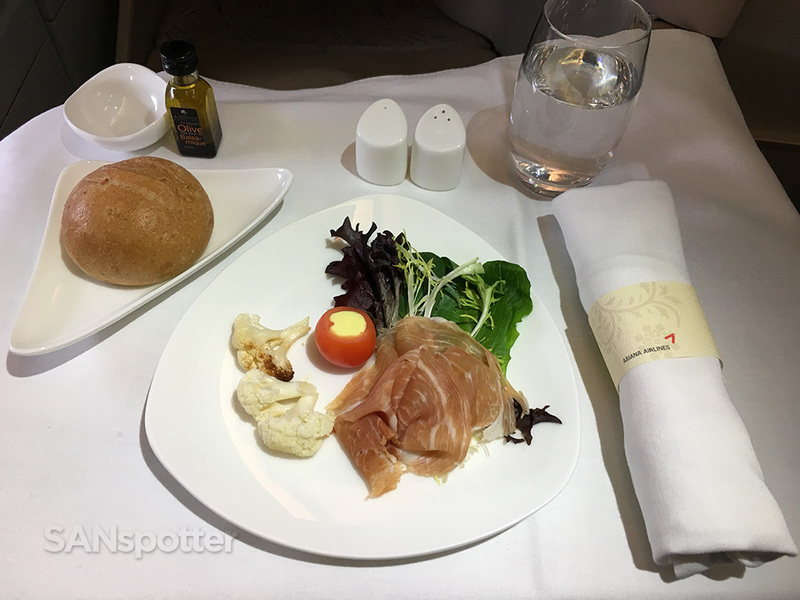 Asiana business class mid flight snack. Sleep was nearly impossible at this point, so I watched a movie (Jack Reacher) to kill some time. It was really good, but unfortunately, I had one glass of wine too many with lunch and I was now fighting a killer headache from it. Wine does that to me sometimes. One glass is usually ok, but anything more than that and I’m reaching for the aspirin. Oh my aching head! I hadn’t had a headache this bad in a long time. Since I’m in the lavatory, I might as well get a nice pic of the wing! Still seven more hours to go. Luckily the movie made me a bit sleepy, and somehow I managed to sleep pretty well for three more hours. 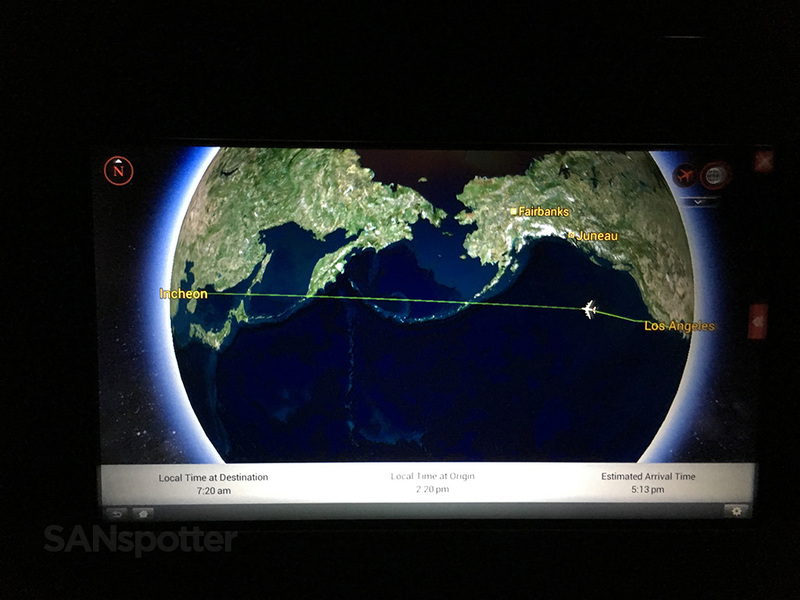 I even amazed myself with that, and I was still feeling pretty groggy when they turned the lights on with two hours of flight time left. It’s time to eat again! Hot towels were quickly distributed before they started with the meal service. The lights are slowing coming on, so that can only mean one thing: it’s time to eat again! Yeah, I went for the western-style meal. I love Korean food, but the Korean choice on this flight was a soup-based thing and I just felt like I needed something more hearty than that. All in all it was pretty good. Very western, but it had just enough of an Asian flair that I didn’t feel like the silly American who only eats at McDonalds when traveling overseas. 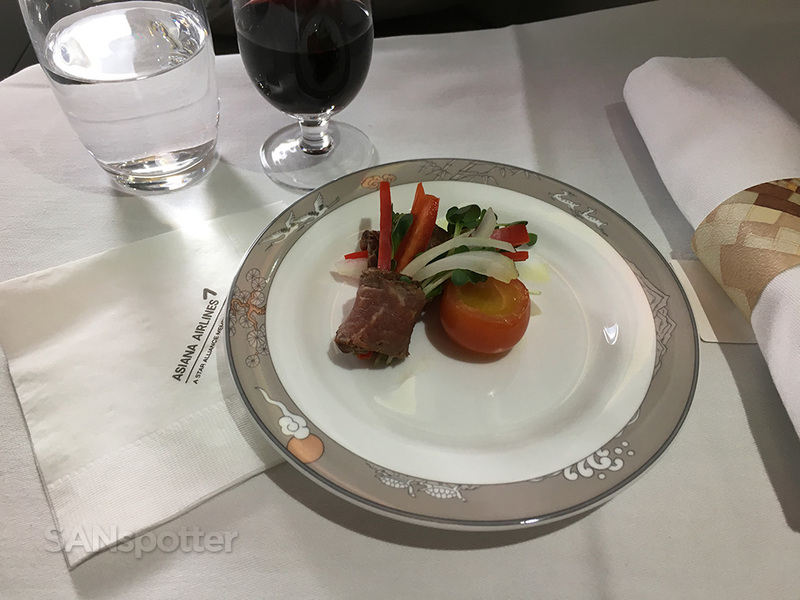 Asiana business snack (second meal) first course: prosciutto ham and vegetables. Asiana business snack (second meal) second course: clam chowder and bacon. 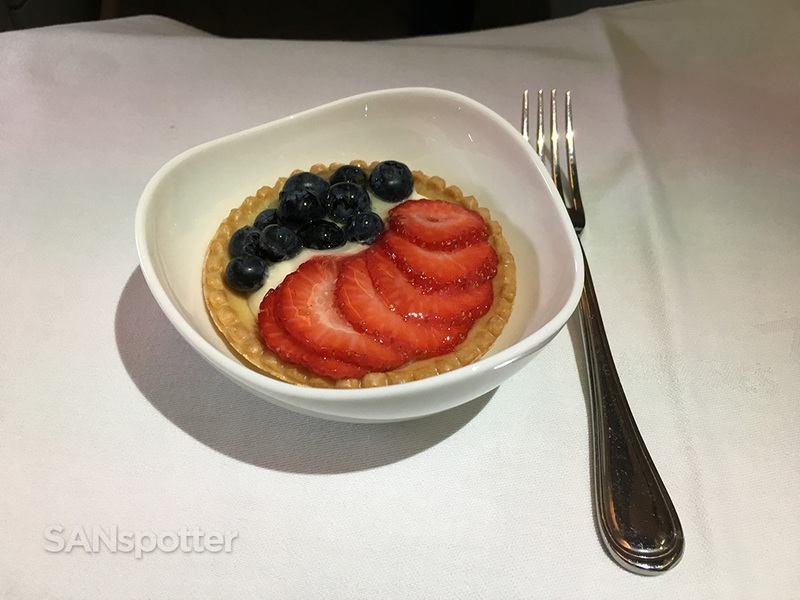 Asiana business snack (second meal) dessert: fruit tart. To be honest I wasn’t all that hungry – but who am I to turn down a free (delicious) meal? 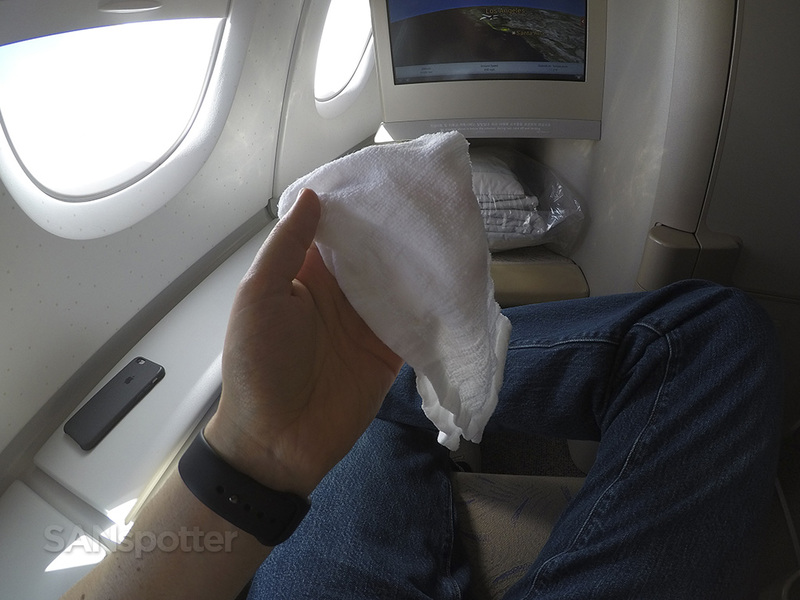 One more round of hot towels were offered at the conclusion of the meal service, which was a new record for me in terms of hot towels received on a single flight. I quite liked it actually! 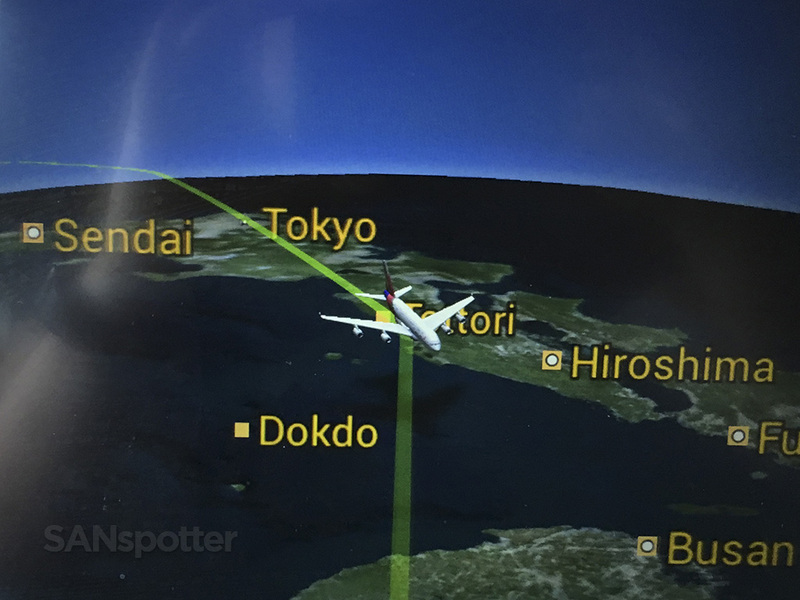 Unfortunately it was completely overcast as we passed over Japan – so there wasn’t anything to see today. Exactly one more hour to go! At least the ground staff won’t have to work too hard cleaning this aircraft. 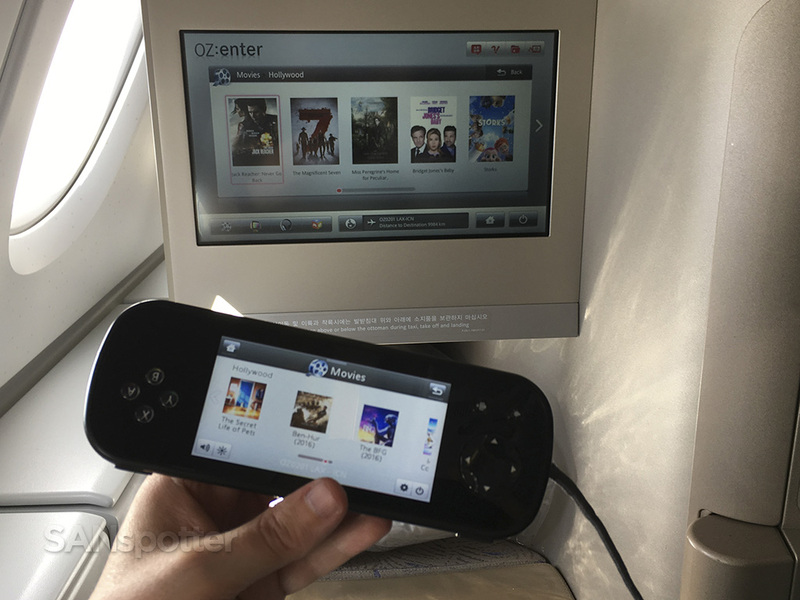 That’s one advantage of an empty flight. 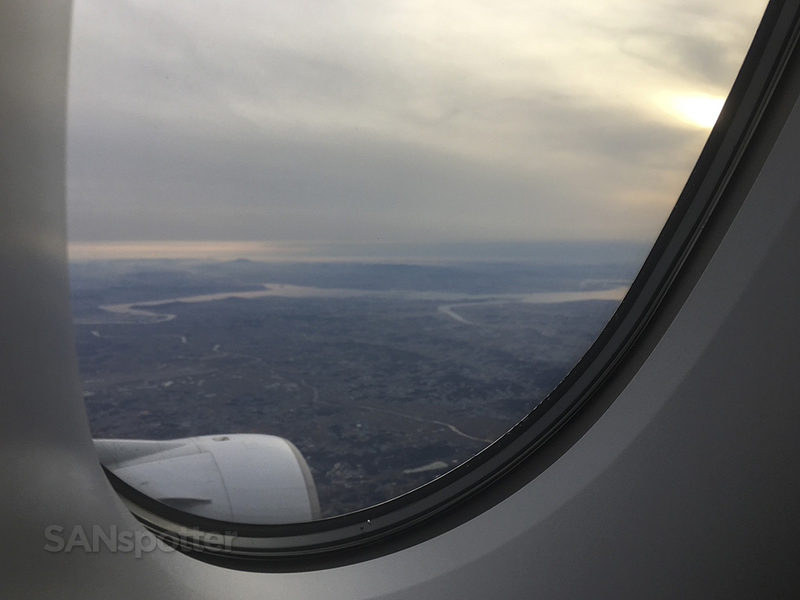 Starting to see the outskirts of Incheon and Seoul. It’s so good to see Korea again! I haven’t spent much time in this country, but it is one of my favorites. And here we are. 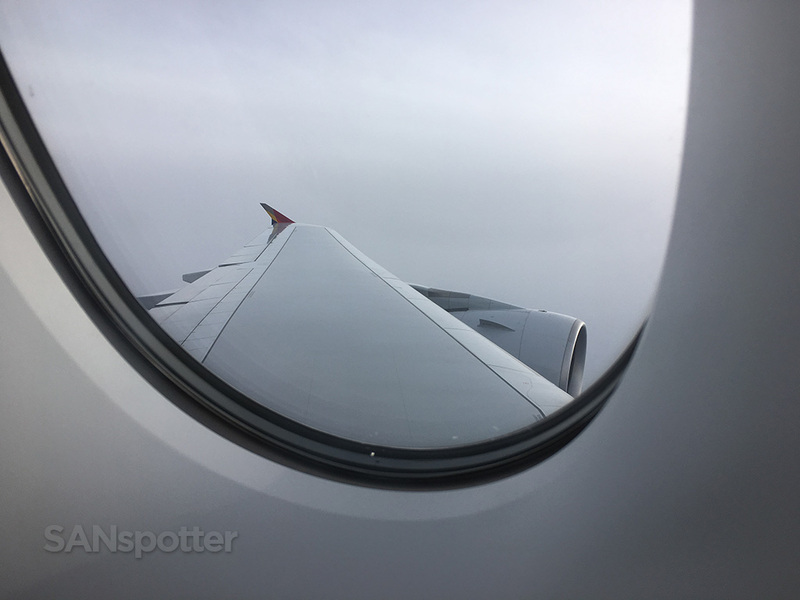 Another fantastic flight on Asiana complete, and I’ll be completely honest when I say that I didn’t want to get off this plane. One last closeup as I was walking off the plane. So long HL7626! Perhaps we’ll meet again? 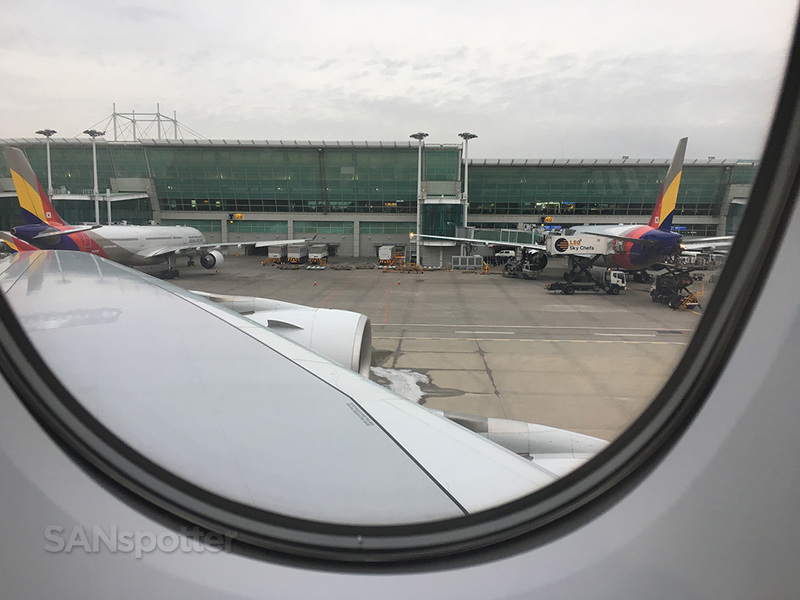 That wraps up my third-ever flight on an Asiana A380, and just like the prior two times, I really didn’t want to get off this airplane. 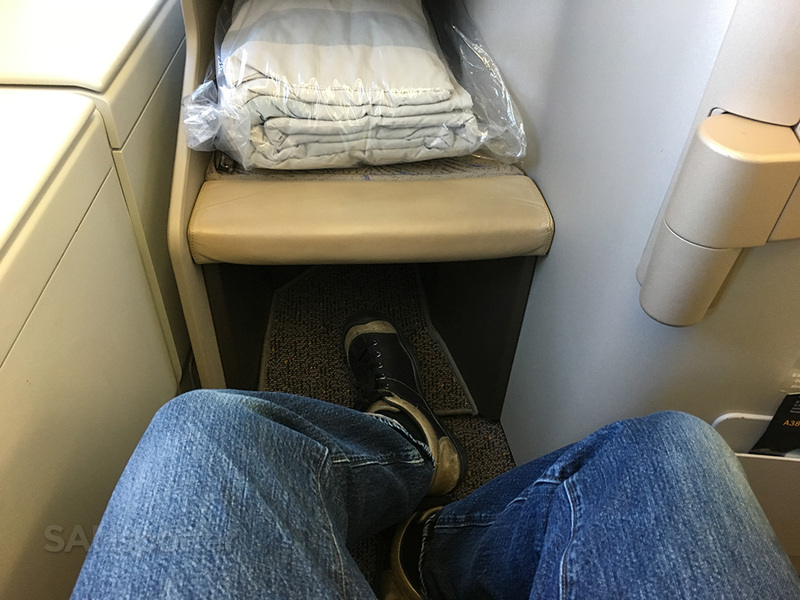 The Asiana cabin crew are top-notch, and they did their best to make me feel like a king on this 13 hour fight from LAX to ICN. 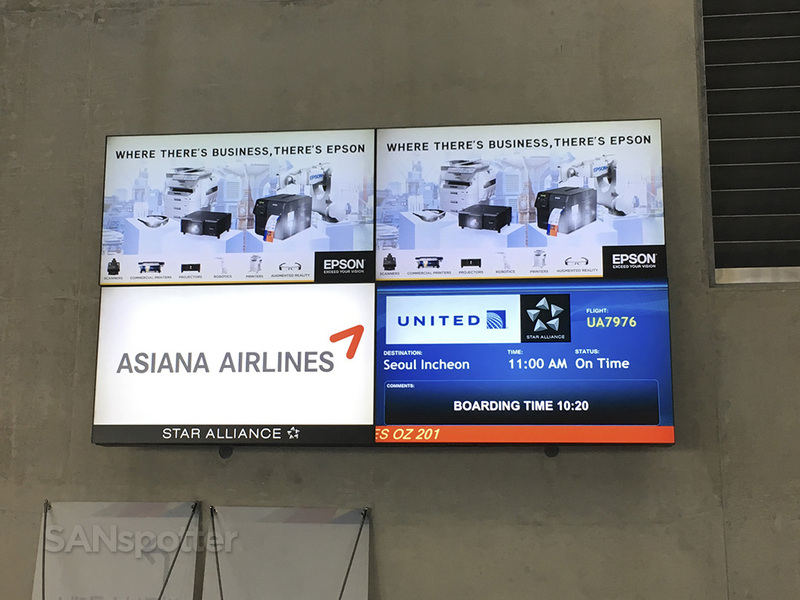 Thanks again Asiana – I will return! Thank you so much Okyoung!! Nice to see you on my blog again. 🙂 These reviews (and videos) take a very long time to put together so I’m very glad you enjoyed this. 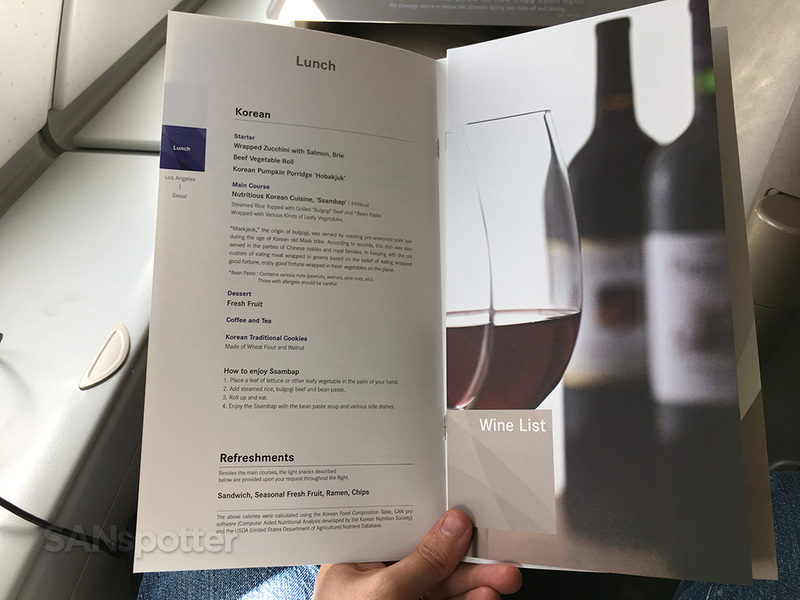 Please be patient for a bit as I finish the others so I can get to the Korean Air Prestige Class review. You will enjoy that one for sure! Great report, has me wishing my sept. flight on the same OZ201 ( seat 9k) would happen sooner. we ( my daughter and I) were able to take the same flight a few years ago, in first class, she still talks about it. Hey, I have the same seat booked in Business Class for Jan 2019. How did you find it? It’s a very good seat actually, and very comfortable. 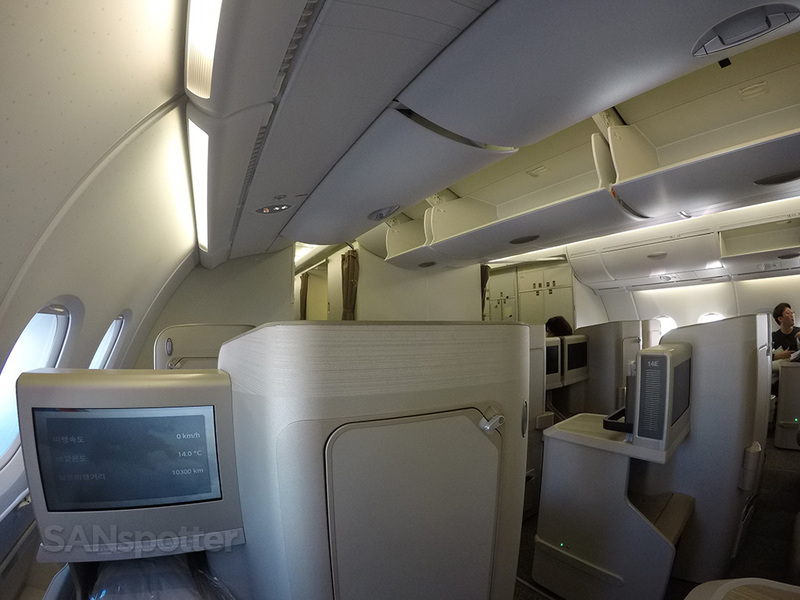 Asiana A380 business class is a staggered layout, with some window seats (like this one) directly against the windows and others along the aisle. 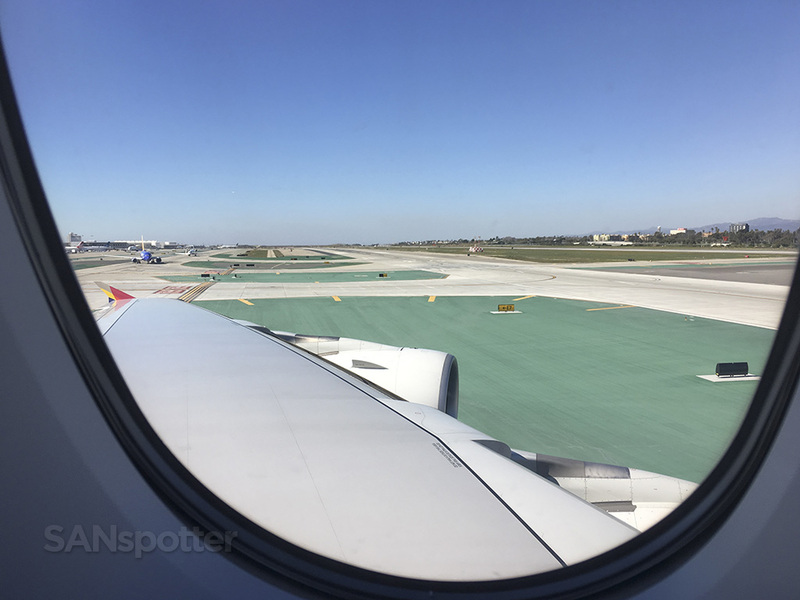 Asiana flight crews are consistently excellent as well so I can pretty much guarantee that you’re going to have a great flight! 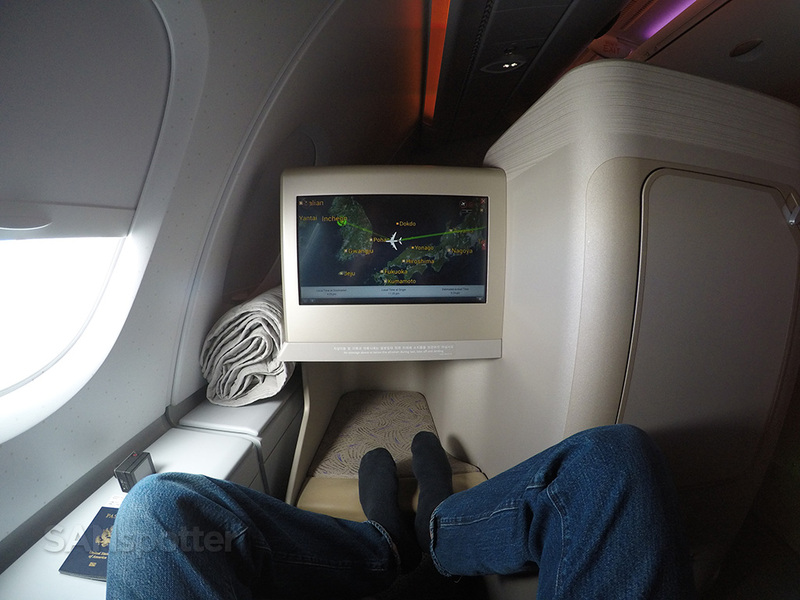 Nice trip review on Asiana. How is Ssambap compare to Bibimbap? 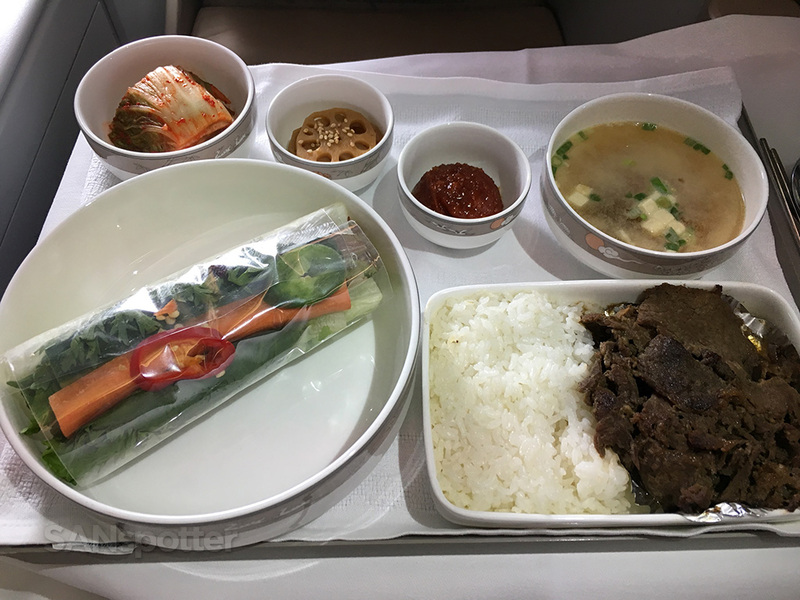 Rival airlines Korean Air serve Bibimbap. Are you redeeming miles for this flight or ?.. Hi Franklin! To be quite honest, I don’t notice much of a difference between bibimbap and ssambap – both use pretty much the same ingredients packaged up in a slightly different way (much like how Mexican food is). Both are equally tasty to me! And yes, I redeemed UA points for this flight via the United Airlines website. No way I could afford this out of my own pocket!